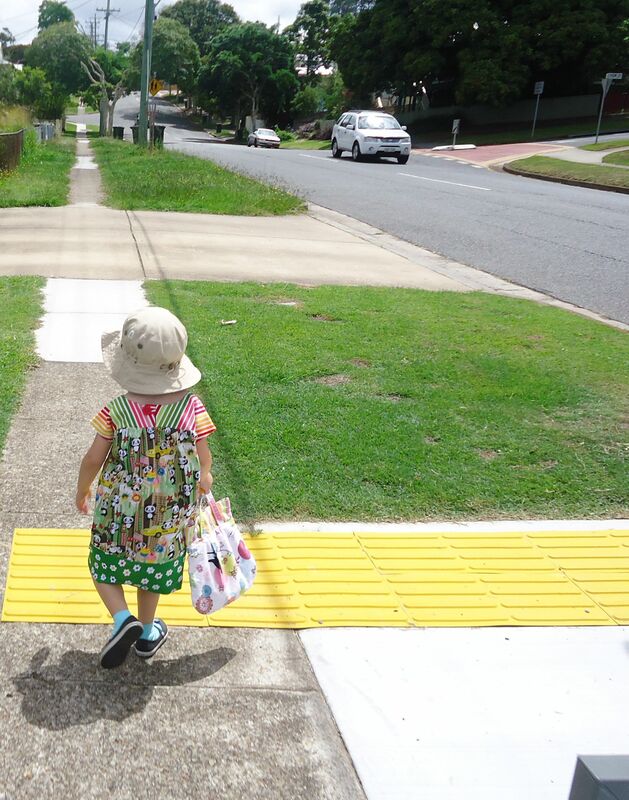 I haven’t written about Lila’s wardrobe for a little while, but we’re making steady progress. 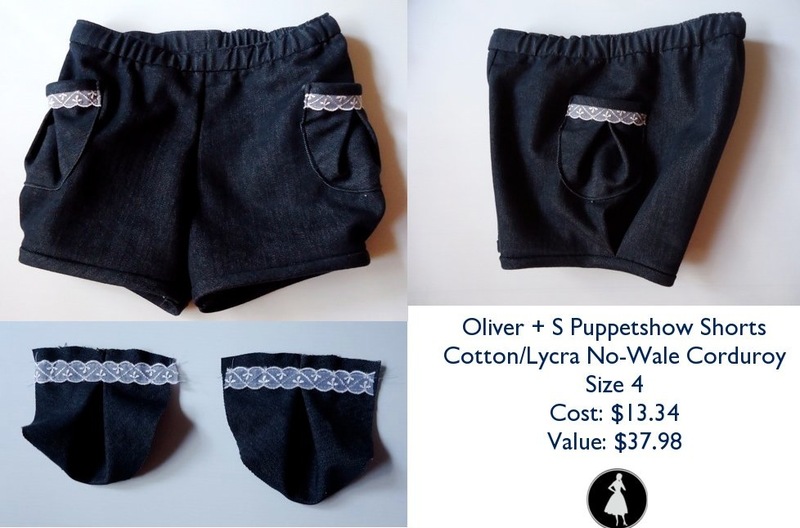 I like to start simple when I’m working on a “wardrobe” type project, so the first order of business was to make Lila several pairs of shorts for the coming summer. Wait, who am I kidding about “the coming summer?” It’s pretty much shorts weather all year around here. I’m sure this sounds delightful to those who hail from cold climates. Lila and I have built her sewing into our “at-home” afternoons, and she’s learning to trim threads as well as what words like “baste” mean. It’s fun, though she usually gets bored after half an hour and decides it’s more fun to stick pins into scraps of fabric. That’s ok, too. 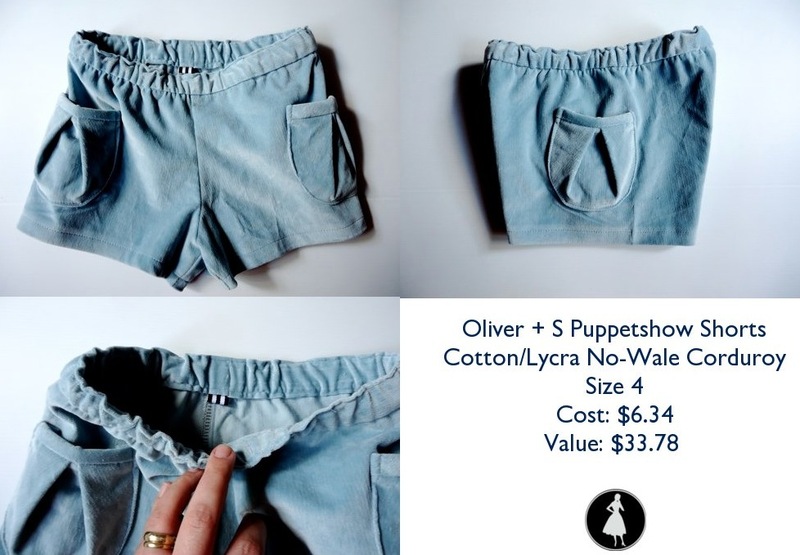 We made three pairs of Oliver + S Puppetshow Shorts this time around. 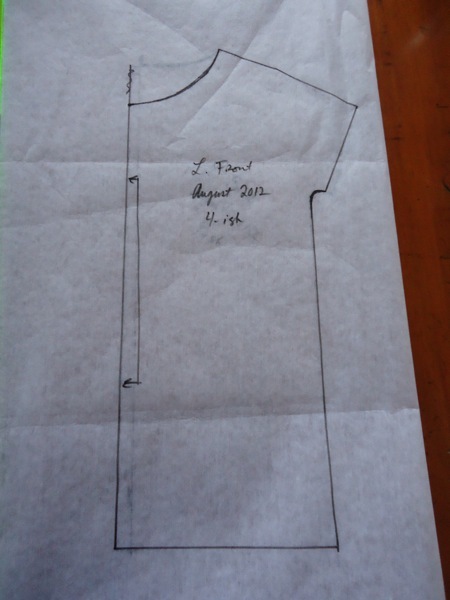 The pattern includes a tunic- I like the tunic but never got around to making it. The shorts are simple, comfy, go together in an hour or so, and I like the quality of the finished garment. I also like Oliver + S for the quality of their instructions and the attention to detail. This is the first pair of shorts made from remnants of my boot-cut Pinkie Pants. The fabric is thick and tough, with a little bit of stretch. I gathered the pockets as per the pattern and hand-stitched the binding at the lower edge for a bit of mindless hand-sewing while I watched Futurama. The second pair, from remnants of my Teal Clovers. I left the lower edge uncuffed as per Lila’s request, and we pleated the pockets instead of gathering. 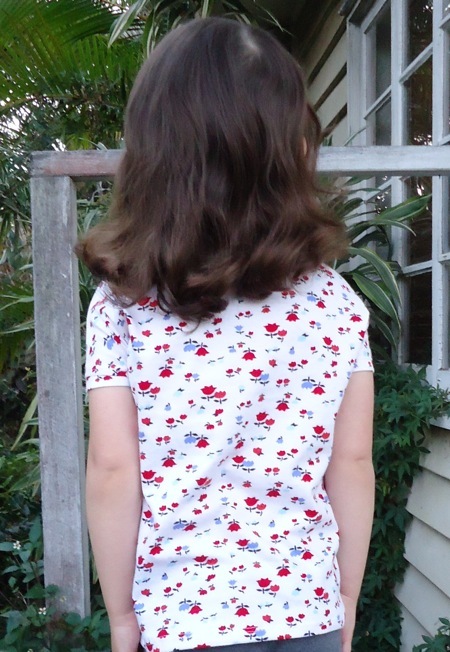 All of the shorts feature a little speck of folded ribbon at the back- it’s a great little detail written into the pattern, and Lila doesn’t get confused when she dresses in the morning. After I saw the twisty looking waistband in the photo, I checked out the already washed and worn shorts and they don’t look that way now. These pictures were taken just after completion, perhaps the elastic hadn’t settled? For the third pair, I was inspired by Jill’s lace trimmed shorts at Handmade By Jill. 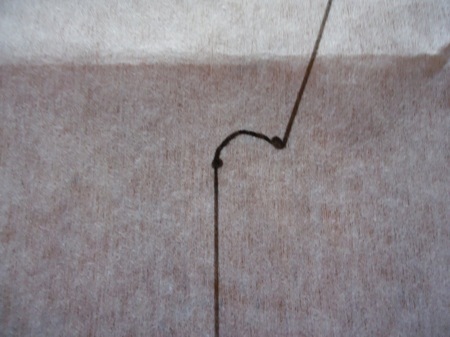 I stitched each long edge of the lace just below the seamline on the pocket’s top edge. The legs pleat into the cuff. 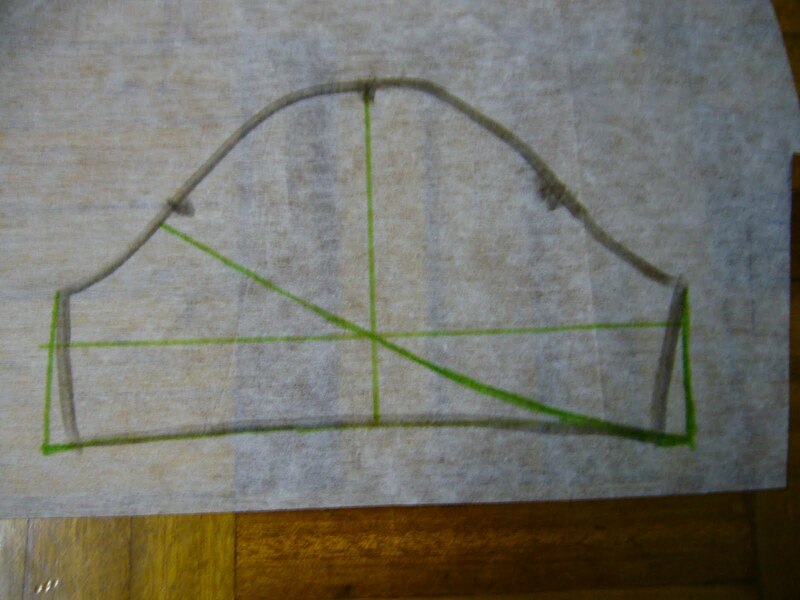 Ever since I read Tanit-Isis’ post on Homemade Legitimacy, I’ve been scratching my head to come up with a simple way to quantify the value of my sewn goods, partly as a way to challenge myself to pay attention to the quality of the sewing. Even for simple little girl shorts. It’s a tricky issue. What’s my sewing worth to my family? When I’m working on samples for Cake or crazy fun experimental stuff, I don’t think about it much. But when I’m sewing things I could probably go out and buy, I have to wonder about the value of my sewing, and whether it’s worth it to sew shorts for Lila when I could go buy them. Rather, I’m thinking about the value of using my sewing for practical, utilitarian purposes. I made a worksheet to keep my thoughts and the numbers in order. After I finish Lila’s projects, I have a few Negronis to make for the husband and I’m curious how the cost/value/price stack up across my family sewing. I broke it down into three pieces. 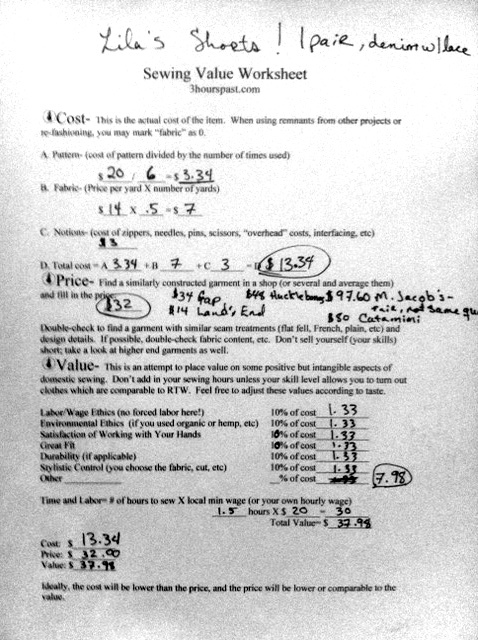 The first is “Cost.” This is the actual, honest-to-goodness cost of producing the garment with raw materials. 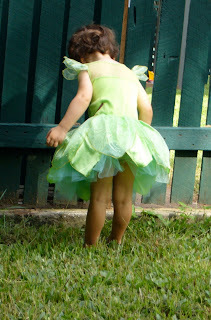 When I calculated the cost of Lila’s shorts, I counted the pink and teal fabrics as “remnants” (free!) and the denim as half a meter because I bought extra on purpose for Lila shorts. I charged myself $3 for the elastic (which was more like $.50) and use of my machine and tools. “Price” means what I’d pay in the store for a similar garment. It’s tough to match a particular ready-to-wear garment unless you actively seek to make a knock off. Also, shopping is a pain in the neck. To satisfy my curiosity, I went shopping online and pinned comparable “bubble shorts” and found prices ranging from $14 to $96. 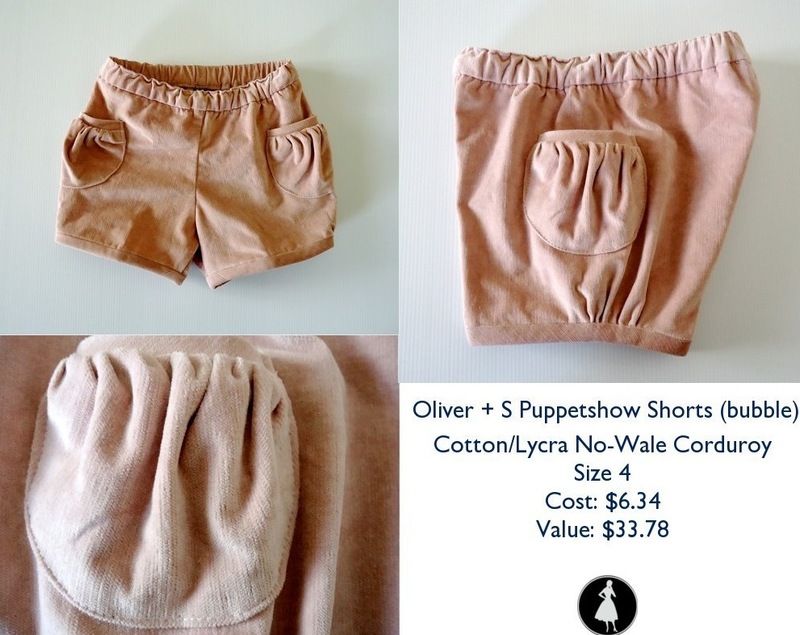 I wouldn’t pay $96 for a pair of Lila shorts, but they are undoubtedly well sewn with some cute (and time-consuming) details and yummy fabric. I settled for a median “price” of around $30- that’s a fairly ordinary retail price in these parts for cute girl shorts made of solid materials with good stitching. Emphasis on solid materials and stitching. It’s false economy to spend $10 on a pair of shorts that will become pilly or unstitched after a few wears. Value is tricky. It depends on the sewist, the garment, and personal priorities. However, I think it is important to factor intangible elements of sewing into the value of the garment. 10% came about as a good, simple percentage and it seems to work well. I could leave out the intangibles, but those personal values keep me sewing and deserve to be counted. I’m interested to hear what y’all think about this, because I’m pretty much making it up. At the same time, it’s important to value the sewing and I have to start somewhere. Finally, I factored in my labor at minimum wage. The minimum wage here (as such) is around $20/hour*. Don’t have a heart attack, Americans, the cost of living is higher. I’m happy to value my sewing time at minimum wage, especially when I’m zipping off several little pairs of shorts with my girlie and generally enjoying myself. I’d love to hear thoughts on this, too. 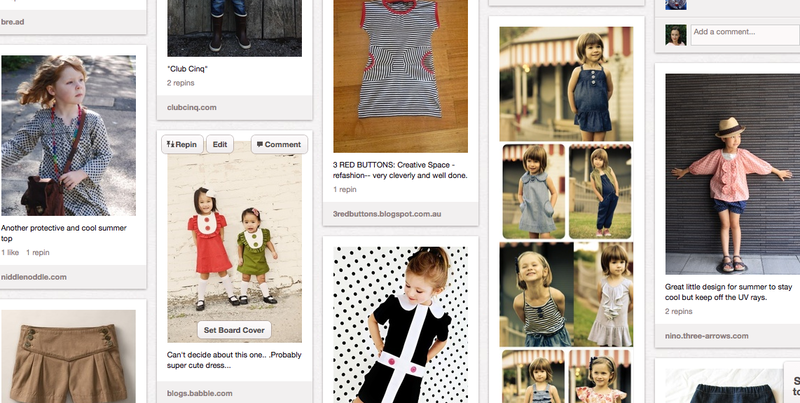 This is how I came up with the cost, price and value of Lila’s denim shorts. My utility sewing has value for my family. 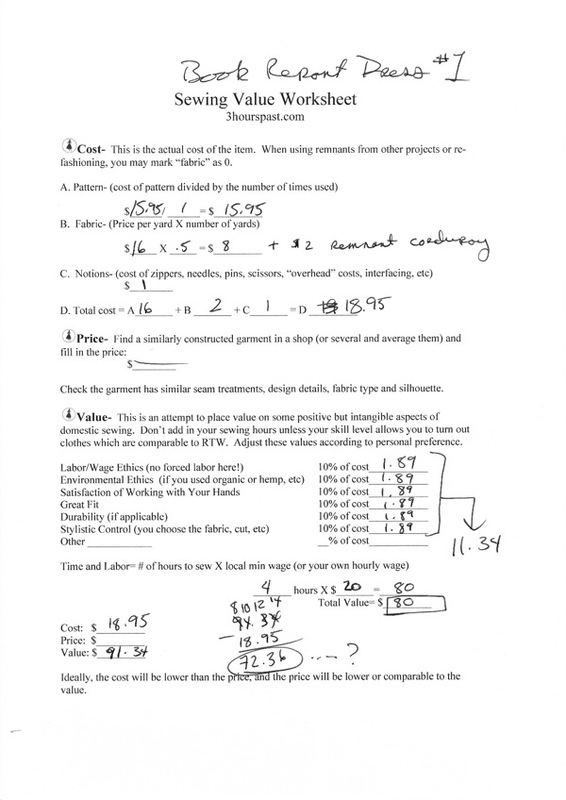 In this exercise, my “price” and “value” worked out more or less the same and I think that’s about right. If “value” fell below “price,” I’d go buy the item because it wouldn’t be worth my time and materials to make it. Probably. “Value” could also come out much greater than “price” for a variety of reasons- maybe the garment was made with time-intensive finishes, maybe I valued Stylistic Control heavily for purpose-built item, etc. However, at this point in my life I have more skills and time than money. 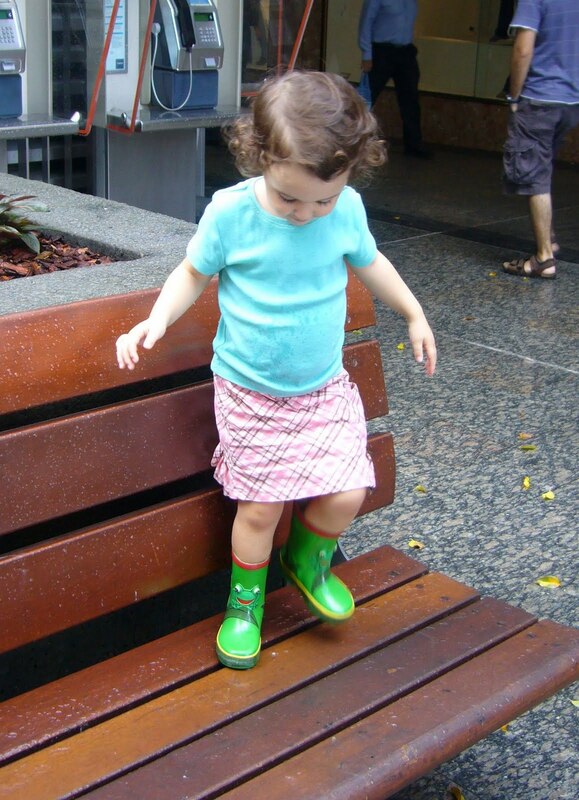 It’s important to me my daughter is decently dressed though we live on a tight budget. I spent under $30 for three pairs of shorts, for about 4 hours of very pleasant work I enjoy. Moreover, I didn’t compromise on quality or personal ethics to “save” money buying 3 pairs of cheaper shorts. 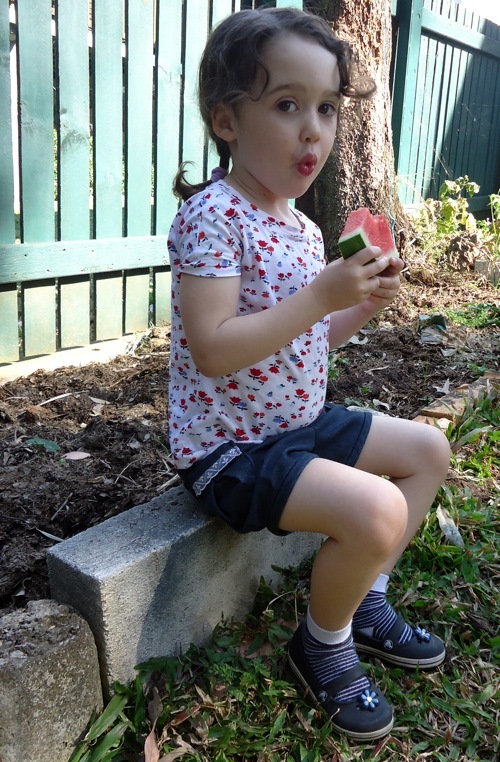 All the seams are well finished, the shorts have functional pockets, are made of durable and easily washed materials, fit my girlie and Lila had some input into the look of the final garment. And the sewist who made these shorts didn’t have to sleep under her sewing machine. I sleep in a nice warm bed. 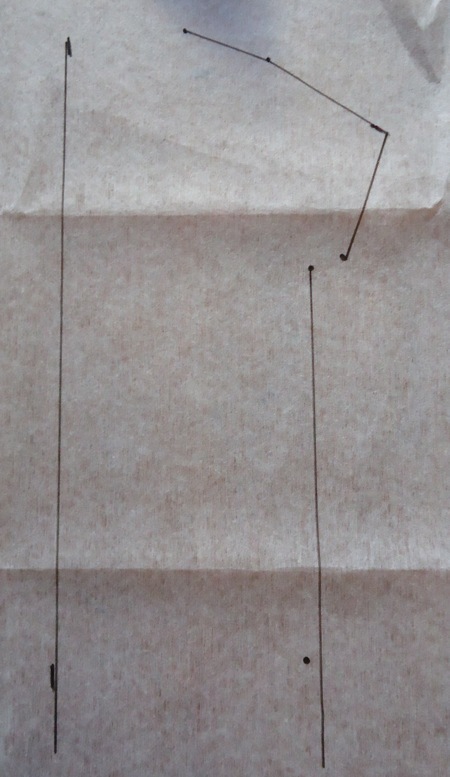 The *only* change I’d make in my sewing after shopping thoroughly for ready-to-wear shorts is to make the front waistband flat and elasticize only the back. I’ll try this when I make her linen-remnant pants and get back to you. It’s only a small detail that’s covered by her shirt, but I’ll know even if no one else does. Click here for your own pdf worksheet. It’s interesting, well- maybe only to me. I like filling in the numbers and thinking about the value of my work, and I want to use the sheets to keep track of the useful but “boring” sewing I do. Boring has value, and charting the value is fun. What do you think? Am I chasing my tail and overthinking everything? How do you value your sewing? What kind of boring sewing is on your table? Do you prefer to buy rather than sew the boring stuff? Do tell! *correction: the official Australian minimum wage is $15.95/hour. I’m going to leave my wage at $20 because that’s the very least I’ve ever been paid here at an hourly rate. 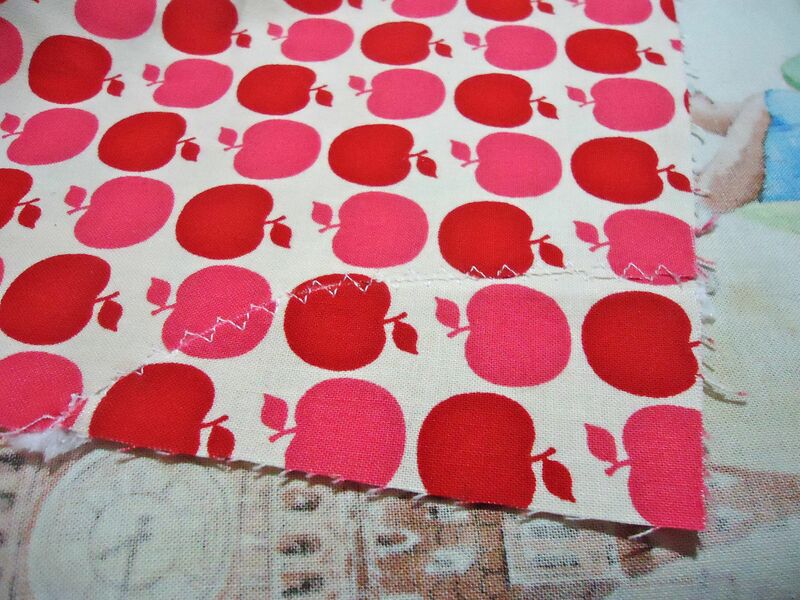 Lila and I set aside time this afternoon to play with fabrics and stitch a little. I was busy last weekend with events, so it was extra nice to spend time focusing on her today. 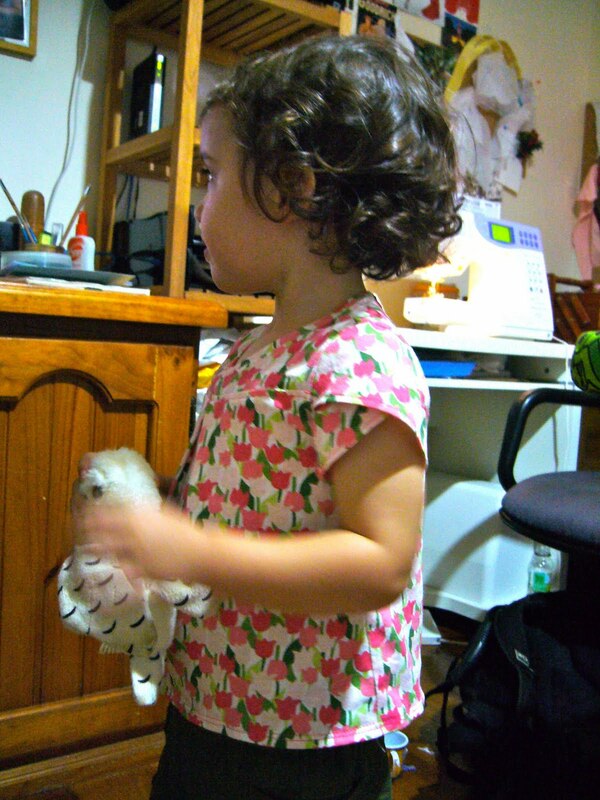 In the past, I’ve mostly sewn little dresses for her and piecemeal separates. She’s getting old enough to have more input with her clothes, and since she’s a bit bigger I feel like it’s “worth it” to sew for her and put some thought into the process. I also have a nice little stock of remnants and fun prints I’ve collected for her, and it’s time to sew it up. Does she wear it? I don’t fight the clothes fight, it’s not worth my energy. If she doesn’t like something, she won’t wear it and woe on the person who tries to force her. Is it stained/ripped/pilly/otherwise falling apart? I keep some icky clothes in reserve for painting and mud play, and I stash some of my favorites for use in a quilt later. If it’s dead, it becomes cleaning rags after I pull off the buttons and any other useful bits. Mending is usually not an issue with her clothes. Is it an orphan? She doesn’t have much of an “orphaned clothes” problem because her clothes are pretty basic and functional. Orphans go out, to rags or to smaller friends if it’s a nice garment. Once we did that (which always takes less time than I think it will), I looked over what was left. 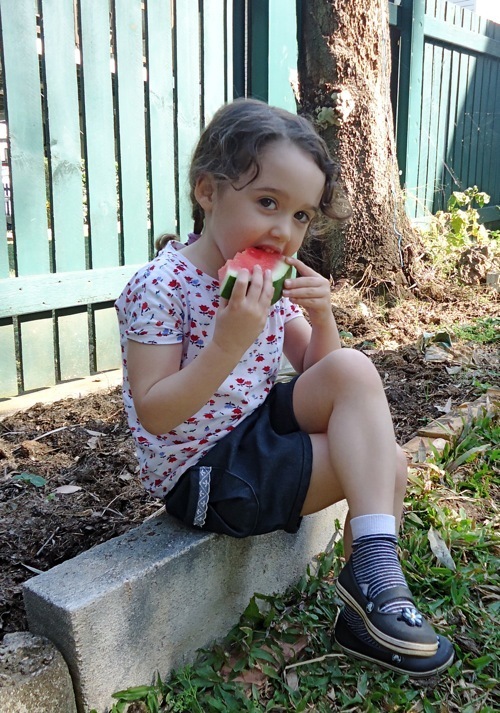 She’s doing well for winter clothes- besides, summer is nearly upon us in Queensland. She needs good summer basics more than anything else- tops and shorts. It’s no good making a little wardrobe of clothes that don’t suit her purposes. I’d love to make a closet full of fluffy, frilly, silly things for her but that’s not her life. Besides, sewing too many of those pretty little girl type clothes is a waste of my time and fabric. She’s a very active 4 year old (is there any other type?) and needs clothes she can move around in. Clothes she can forget about. She also has very tender skin and we live in the UV-saturated part of the world. The earth is closer to the sun during our summer than during the Northern Hemisphere summer, the air is less polluted which means less UV protection, and there’s a hole in the ozone around here somewhere. Sunscreen alone doesn’t cut it. I want to make her at least two long-sleeved, loose woven tops and a few simple loose pants for sun protection. It’s also important to figure out design details ahead of time. It doesn’t have to be an involved process, I’ve wasted hours of my life in the past making wardrobe plans that I found very hard to stick to once I started sewing. Sometimes the fabrics have other ideas than what’s in the plan. I find it useful to keep track of inspiration photos. Pre-pinterest, I kept files of images on my computer. I still do that, but it’s much easier to type “little girl shorts cute details” into google image search and pin like mad. Once I start gathering my inspiration, I usually notice what colors, cuts, and details consistently catch my eye. I can then scroll through with Lila and she lets me know what she likes. Every fabric along the top is either reclaimed from a Mommy-wadder or remnants from my own sewing. Free clothes for Lila! I also found a skirt I cut out yonks ago and never put together, so I’ll add that to this bout of sewing. It’s super tempting to load up on prints (especially for a little girl) because there’s SUCH a variety of gorgeous printed fabric out there. I don’t generally like the “mixed print” look, call me old-fashioned. It’s very difficult to build a nice versatile basic wardrobe using prints for both the tops and the bottoms, so I usually stick to one or the other. Instead, I like to rely on texture for variety. It’s safer. From left to right, the fabrics are an organic cotton canvas, cotton pique, cotton no-wale cord, medium weight denim, and linen. Along the bottom of the photo, I laid the fabrics for her tops. The wovens will become long-sleeved tops (she insisted I use the brown, and it suits her, so ok), and the knits will become versions of the Blank Canvas Tee I made for her or Hopscotch Tops by Oliver + S. Usually, I’d pick a neutral, a main color and an accent color for a wardrobe but for Lila I just went for general “harmony” between the fabrics we chose. I also want to make her a few dresses. She likes wearing them, I like making them. She has five or six Ice Cream Social dresses, so I spent a little time looking around for alternatives. She’s infatuated with this organic cotton sateen I scored the other day at Fabricabrac (great day! Will do a round up this week!) and I thought I’d use this pattern. 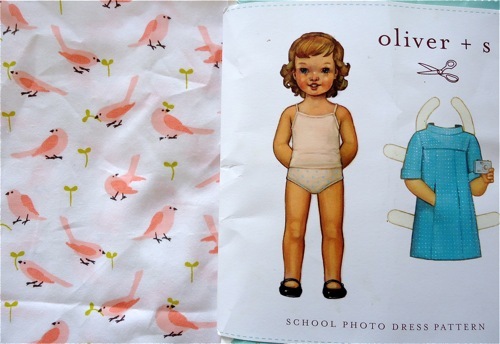 I have a “thing” for Oliver + S. If you’ve ever sewn with them, you understand. 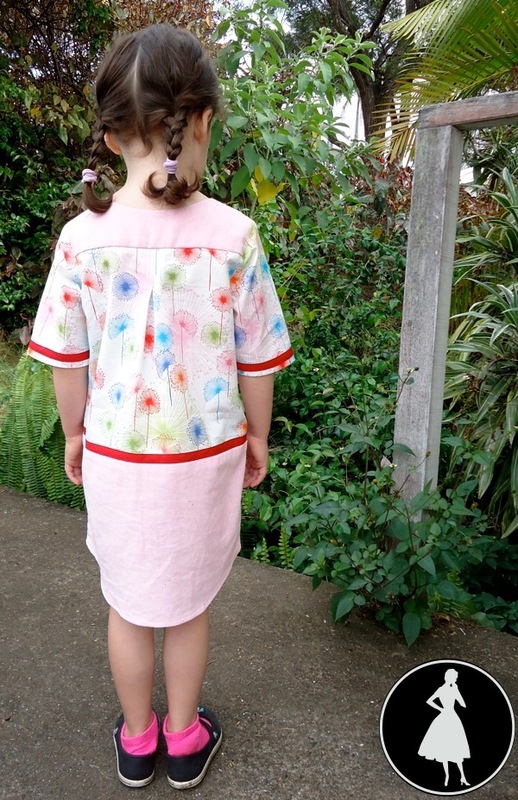 If you haven’t, and you sew for kids, I would strongly recommend taking a look. The instructions are sensible, the clothes look like “real” clothes, and I like the way the separates work with one another. They’re a bit expensive, but it’s worth it. I’m planning to make her one (at least!) of these for summer, too. Doesn’t it remind you of a little girls’ Cambie? This dress is the “reward” for making it through the other pieces, we’ll hop over to Voodoo Rabbit and pick out something nice and distinctive. Pandas, pet deer, who knows what she’ll pick next? 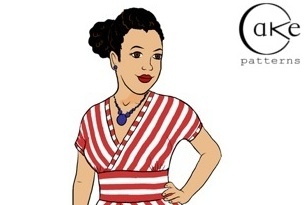 This dress is not a pattern, but a very clever “hack.” I’m itching to play with it! Check it out. Culling the existing wardrobe, gathering inspiration, thinking about Lila’s clothing in a practical way, and playing with fabrics and patterns isn’t exactly play, but it’s fun and doesn’t feel much like “work,” either. The transition from the planning stage to the sewing stage of a wardrobe project can be a little tricky to navigate. I have been known to put all the patterns and fabrics together then stare at them for days or weeks on end, unsure where to begin. I say start simple, start practical. 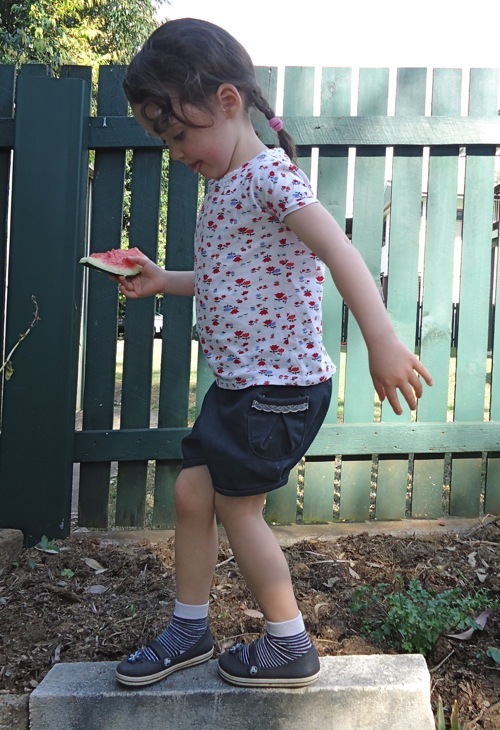 We made a pair of shorts today to kick off the project because that’s what she needs most. Next week: Shorts, shorts, shorts. 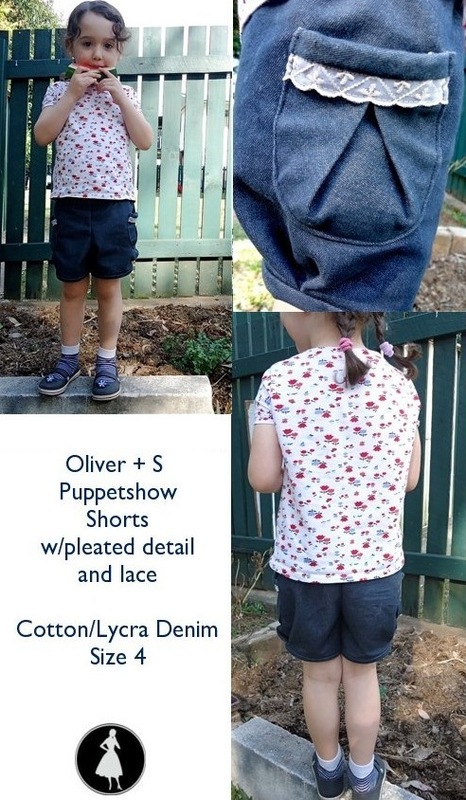 Further Reading: Making a simple kid’s pants pattern from an existing pair of pants. Tiramisu Testing Update: Wow! I’m all kinds of excited and energized by your warm reception of the Tiramisu lady, thank you so much for your kind words, clever backstories and beautiful name suggestions! I’m sifting through everything and I’ll be emailing testers later this week. Thank you all for volunteering to test! If you haven’t already, skip over and leave me a note if you’d like to test, or if you’d like to add to her backstory. Also- one of my buddies who doesn’t sew but nurses her sweet baby agreed to test Tiramisu for nursing-mother-wearability. She and I used to live together, I guess she’s used to me because she didn’t bat an eye when I asked for her help. I’ll run one together for her and we’ll report back! My little girl needs some clothes. 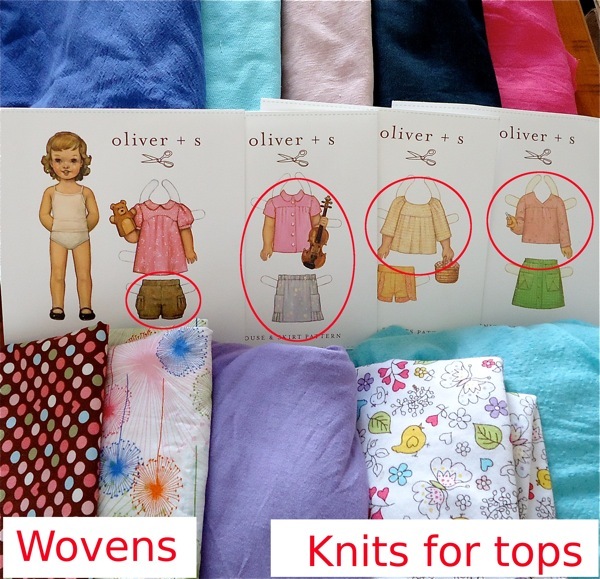 I have a little hoard of fabrics for her wardrobe and a stack of Oliver + S patterns. Since I made my own Blank Canvas Tee pattern last year, I’ve wanted one for Lila. It’s easy to alter the cut for fun designs, it’s simple to sew and comfy to wear. I also find the BCT sews together very quickly, always a plus. I haven’t played much with patternmaking for Lila, mostly because kids’ bodies differ greatly from adult bodies in terms of topography. I’m more used to making patterns for women’s bodies. With a kid, I don’t need to worry about accommodating the bust. Easy, right? She and I talked about this, and she’s happy for me to share with you all the process of making a capsule wardrobe for her. 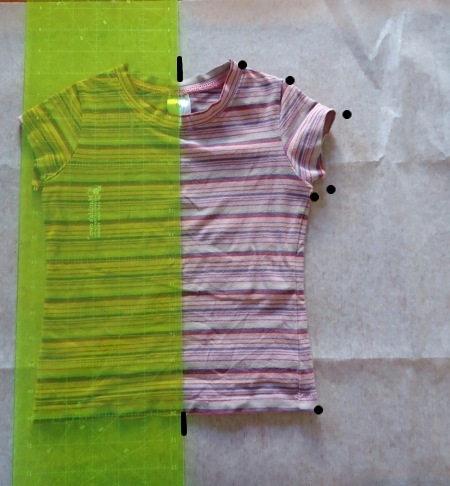 I thought if I documented dolly’s process it would help me show how I put together a wardrobe sewing plan. She’s small, so the sewing will go quickly! When I laid it flat, the seams wanted to twist. 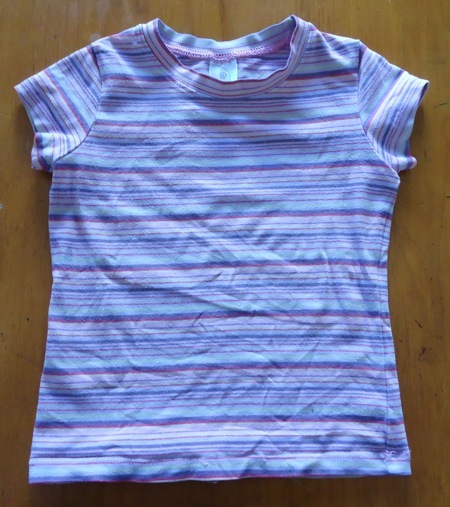 This is because it’s a mass-made tee and in that environment, they cut t-shirts off grain to “save” fabric. I ignored the seams and just patted the shirt flat. I used one half of the shirt as a template. 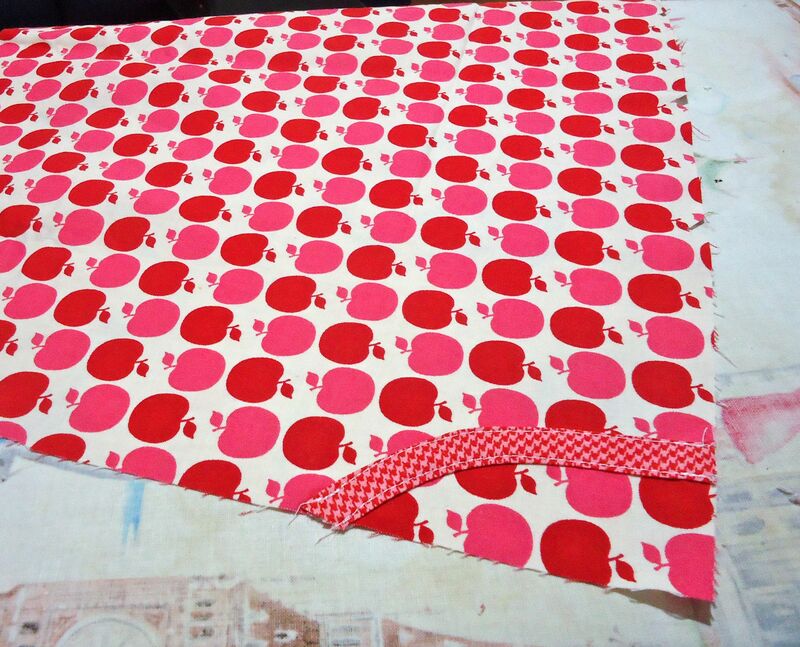 I made dots at the neck-binding seam, at the shoulder, at the sleeve openings, the underarm and the lower edge. 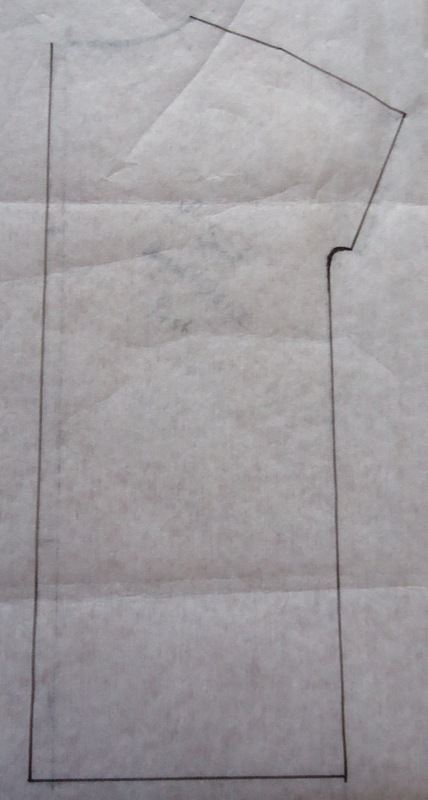 The template shirt has regular sleeves, but I’m making one with cut-on sleeves. Took away the shirt, time to connect the dots! 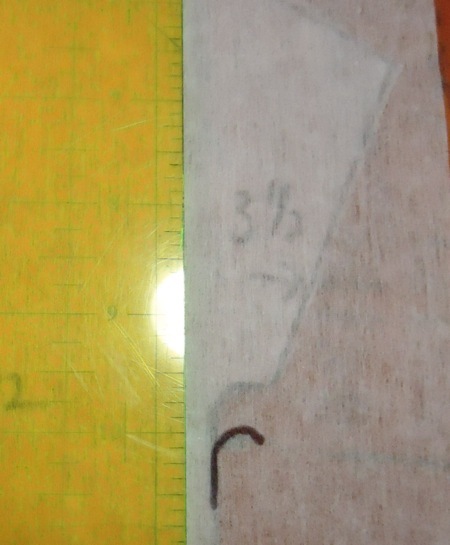 First, I connected the dots along the straight edges and the CB using my ruler. I’m making the back piece first. 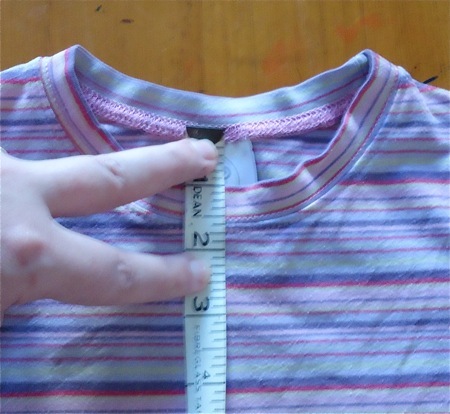 I also extended the side seams and CB several inches beyond the original shirt hem. If it’s too long, I can call it a tunic and she’ll grow into it anyway. At the underarm, I drew a little curved line. 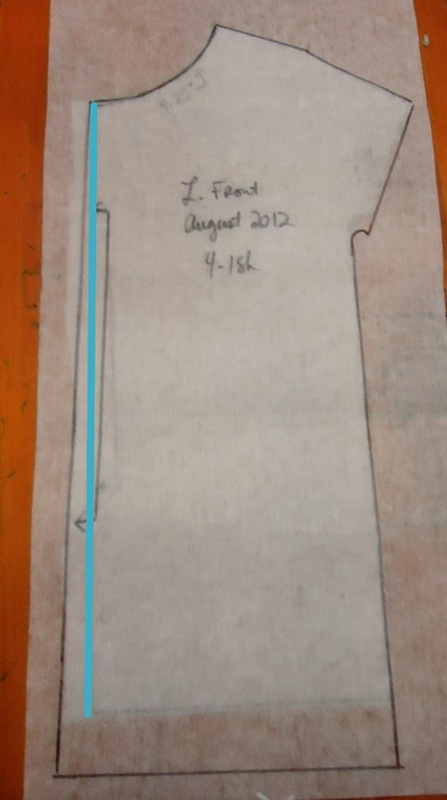 At the CB, I added a scant 1cm (about 3/8″) because I want this shirt to be just a little wider than the template shirt. 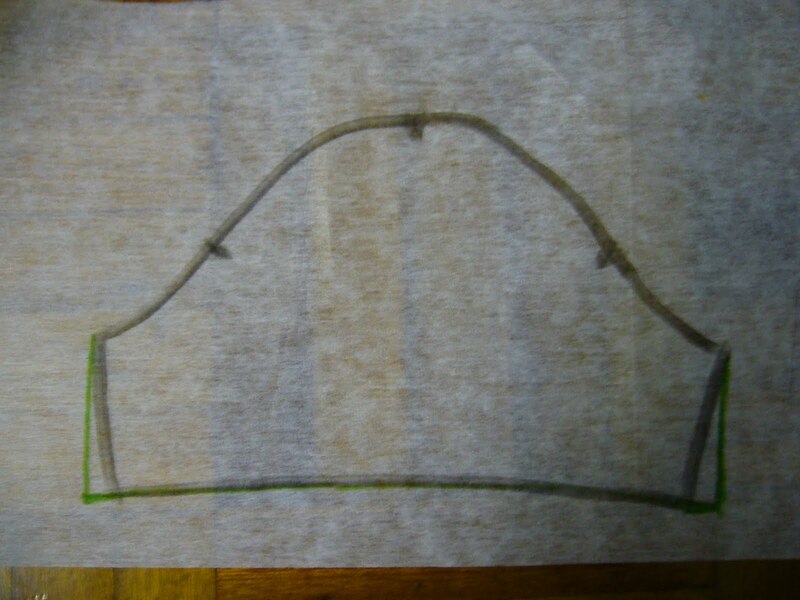 Then I drew a curved line at the back neck. I decided at this point I didn’t like the shape of the sleeve, so I corrected it. 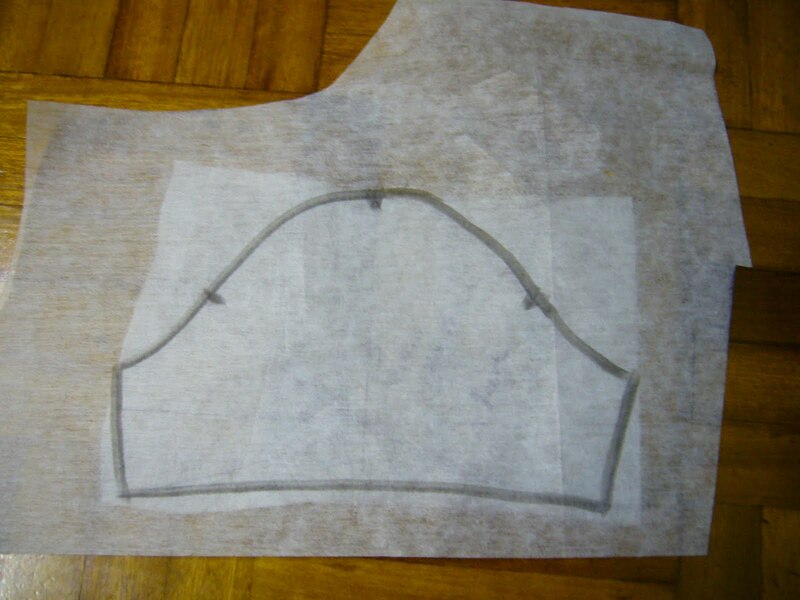 I laid another piece of tracing medium on top of the back piece and traced it off identically except the neckline. The template shirt was a crewneck. 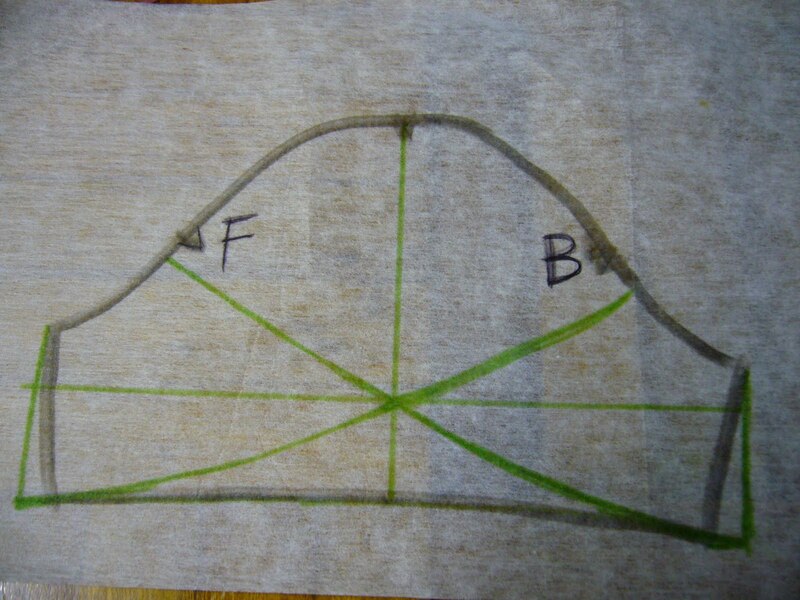 I measured the difference between the CB neck seamline and the CF neck seamline. It was about 1 3/4″ (3.5cm). 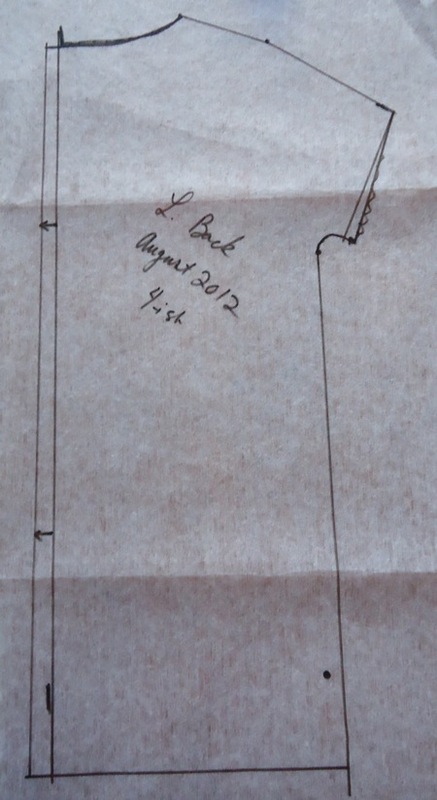 On the front pattern piece, I measured down 1 3/4″ (3.5cm) from the back neckline and made a mark for the front neckline. 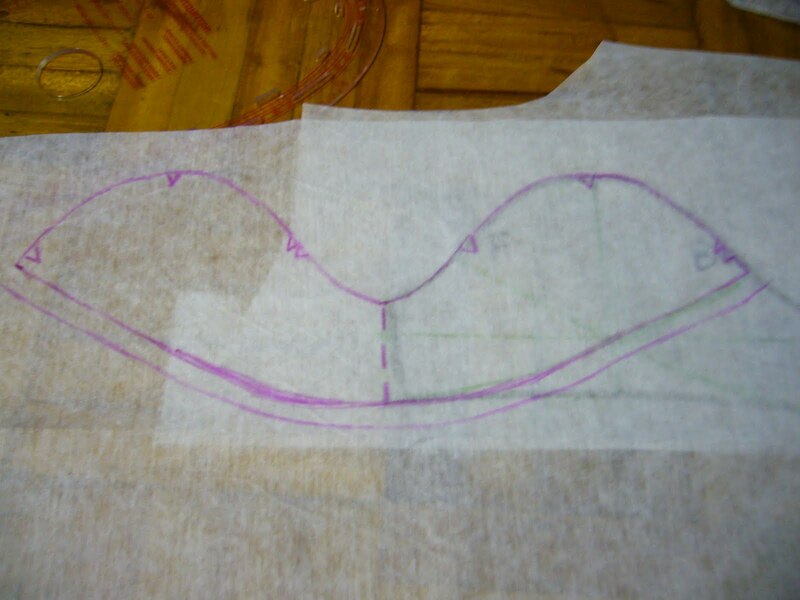 I drew a nice neckline curve and labeled the pattern pieces with Front/Back and the month and added seam allowances. 1/4″ (6mm) is customary for knits. 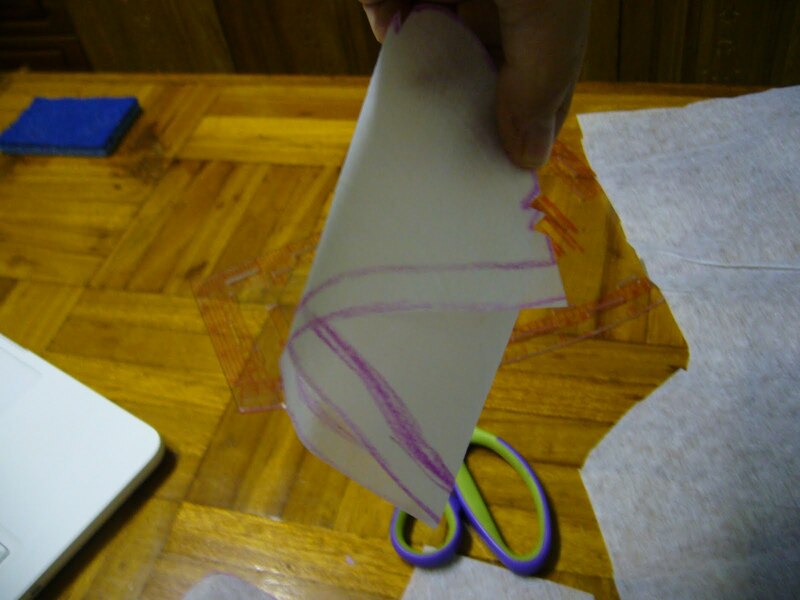 To finish the pattern, I measured the neck and the sleeve openings and made bindings. I think I’ve written about that before, but if you want a refresher just click on the mini-tute. My bindings for knits are almost always 1.5″ (2cm) wide. Then I stitched the little shirt together. 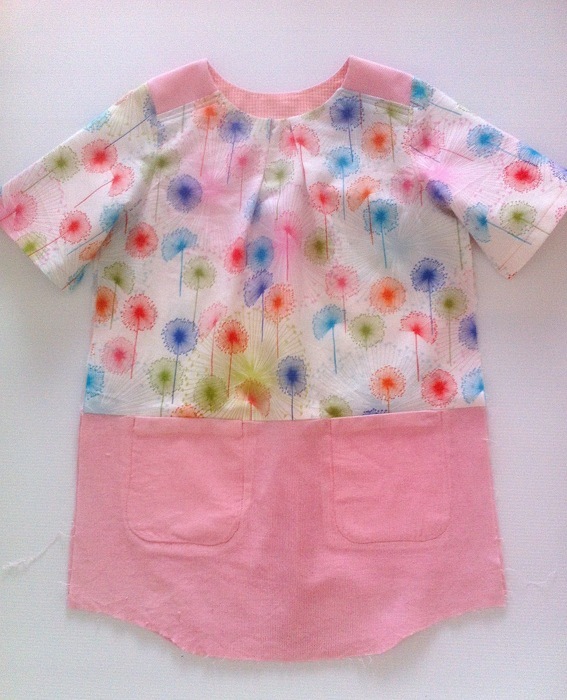 I used a tiny piece of cotton interlock I bought on sale some time ago, with the idea I’d make some baby pj’s. It never happened. I grouped these photos together as well, it’s just a basic tee construction like the adult Blank Canvas Tee. 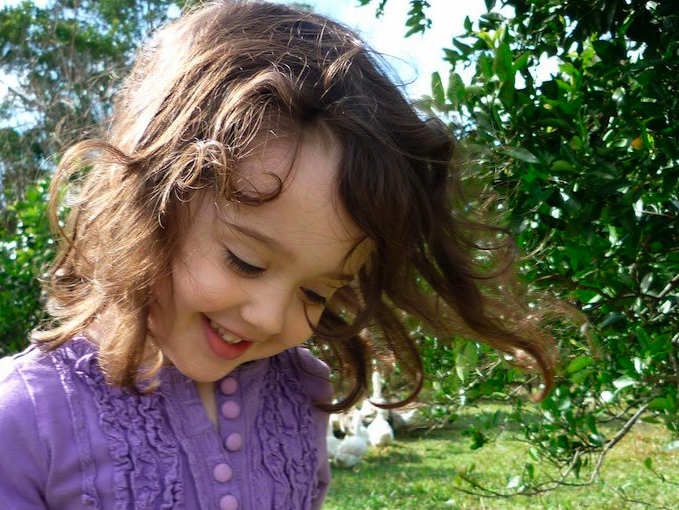 We took a few quickie photos after preschool. It’s not bad. Note the gentle wrinkles. They’re pull lines because the pattern doesn’t match her body. The back is fine. I decided the sleeves looked a little weird and I should make the openings larger. You can see the pull lines in this photo, too. It’s not a big deal, it’s just because I didn’t draft her tummy into the front pattern piece. Other than those two tiny details, I was quite happy with the draft. She likes the shirt, too, and wore it all day. 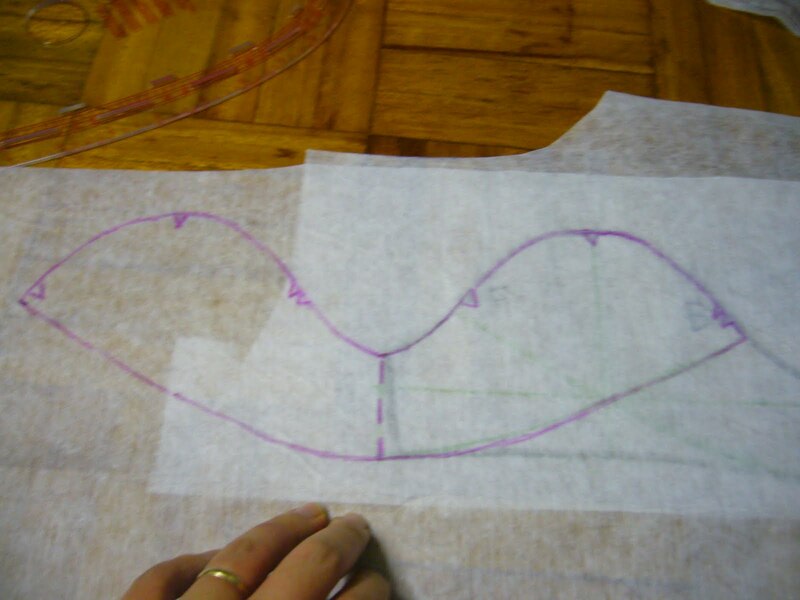 On each piece, I dropped the underarm curve about 1cm (3/8″). For the back piece, I then re-traced the whole back and set it aside. On the front, I dropped the underarm curve and retraced all but the CF line. The blue line here shows the original CF. 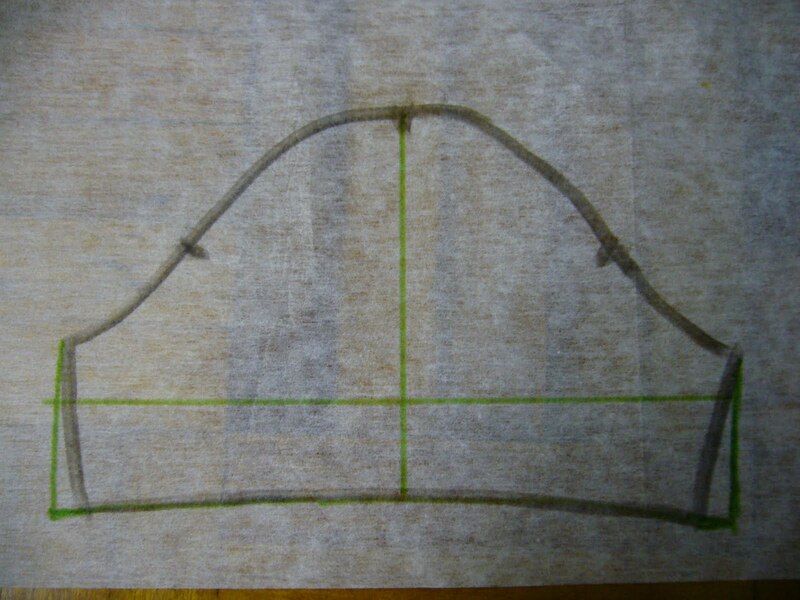 To accommodate her tummy, I swung the bottom of the CF out by about 1/2″ (1.2cm) but kept the same CF point at the top. 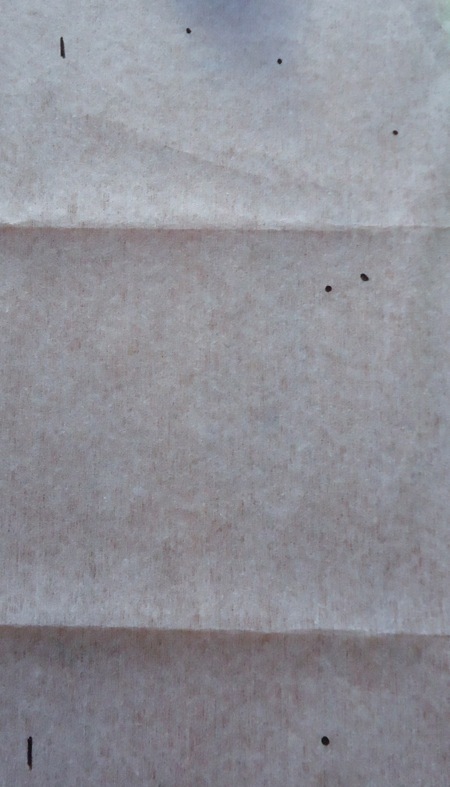 These little tweaks were minor enough that I didn’t make a second muslin. Instead, I’m looking forward to chopping into it for a little mini-hack! I want to open the floor to questions about wardrobing, from those who may not have sewn one before. I’m planning the posts I’ll write for this and I’d love to answer questions or clarify the process as much as possible. I find “wardrobing” is the most efficient use of my sewing time and materials, and I tend to put together collections of garments to be sewn at the same time rather than one-offs. This is what I am working on for Lila. 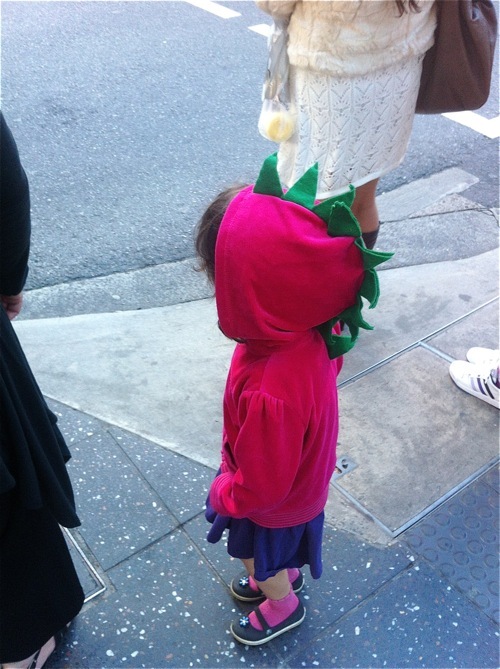 Even though she’s a little girl, I use the same “framework” I’d use for a grownup wardrobe. So… What are your questions about wardrobing? What would you like to see covered while I document her wardrobe process? If you use this tutorial, let me know or link me… I really love to see what others do with the ideas I send out into the universe. 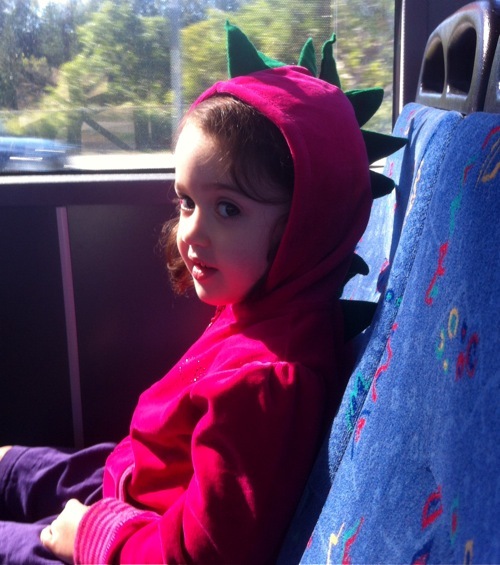 Lilasaurus rides the bus to the city. I thought I’d take a break from stretch pants pattern and alteration posts to show you what I threw together over the weekend. My niece and nephew all but share a birthdate, so my SIL throws one big party for them- usually themed. 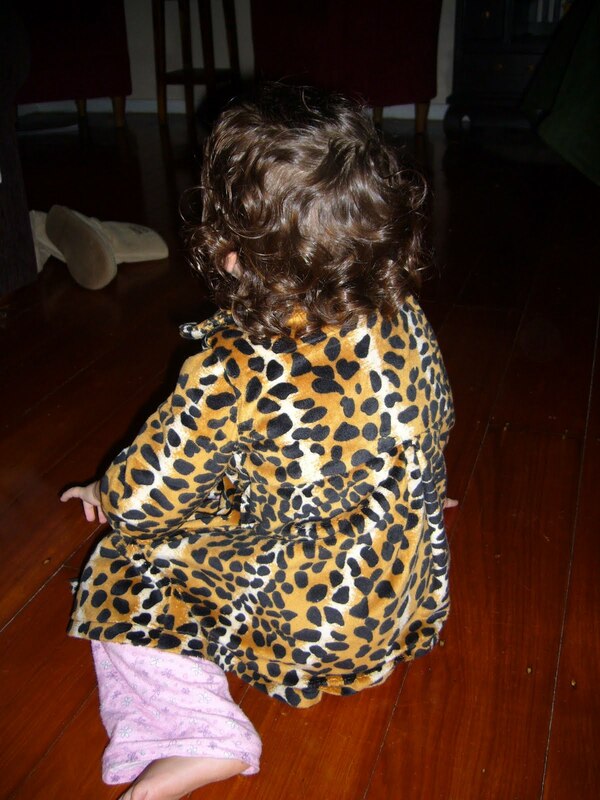 Last year, I made Lila a leopard-print coat dress for the Jungle party. (I have this crazy idea that I don’t like little kiddie jumpsuity animal-ly type costumes. I like costumes to be semi-wearable garments.) This year, they were all about dinosaurs. Lilasaurus helps Mommy look for stripey fabrics. Hmm. I had no idea what to do for the costume, so I procrastinated. On Friday, Stephen told me the party was that weekend, not the following weekend as we’d thought. Awesome! Luckily, I found a cute (and very very quick) tutorial for a dinosaur hoodie from DIYing to be Domestic. It’s a new-to-me blog, but I love what she does! Her hoodie is a little different from mine and she does a great job of showing you how to make it, so skip on over and check it out for instructions. 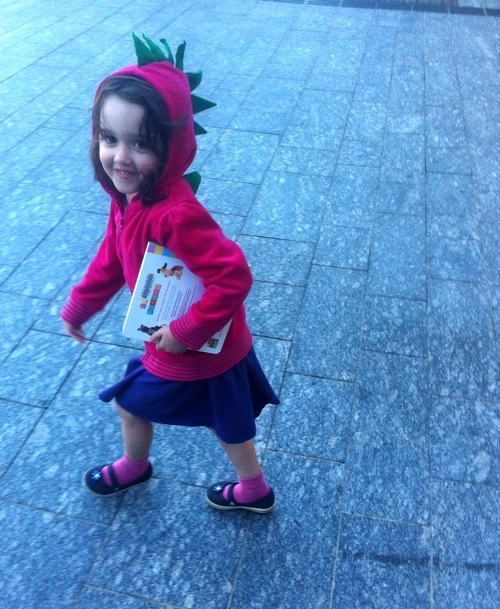 Lilasaurus standing on a street corner just before a pair of Japanese hipsters giggle and ask to take her picture. This hoodie uses felt diamonds and a pre-made hoodie. I can’t believe I had to go to four stores before I found a kinda-sorta plain one! It’s nice and plushy, and has some cutie girlie details. 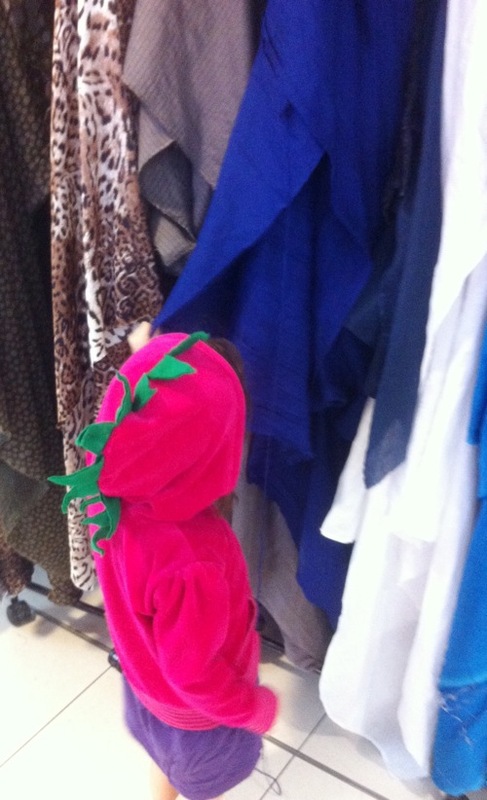 Lila wanted a pink hoodie with green spikes. Ok, kid. 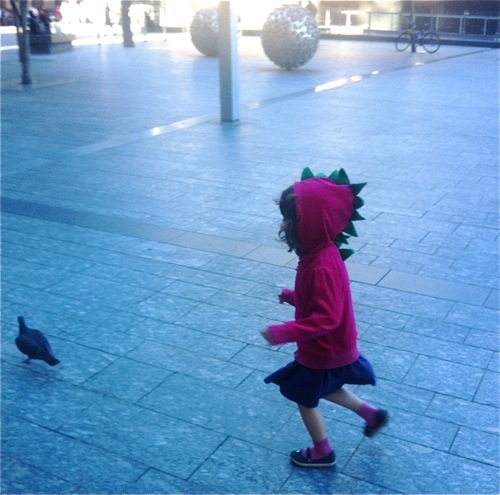 Lilasaurus wants to catch a pigeon. 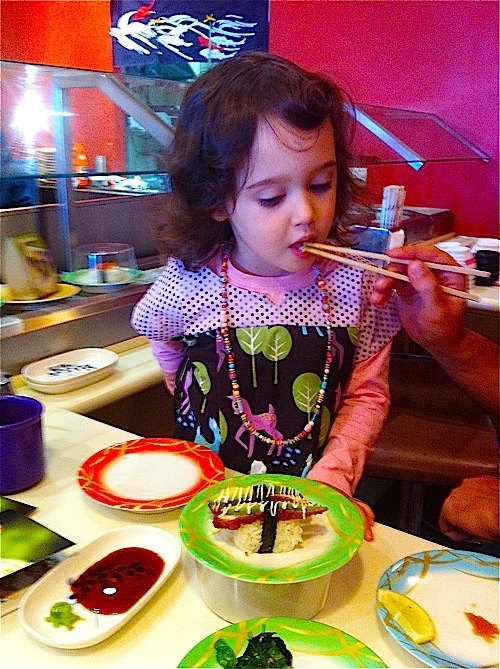 Lilasaurus stands in line for sushi. Lilasaurus loves the pretend pirate ship in the Bontanical Gardens, and learned the word “steering” because we don’t drive ships. 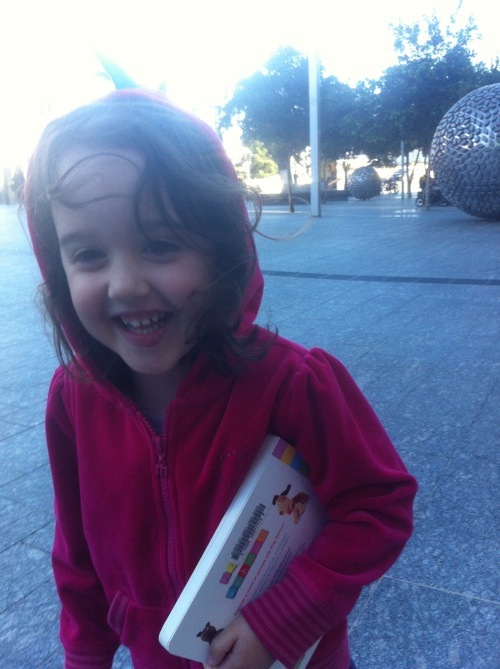 Lilasaurus gets a book from the library. I had originally planned to remove the spikes after the party, but she loves her little hoodie so much I’ll leave them. We have such good fun on these afternoons out, thanks for letting me share! I woke up this morning to nearly 80 new data points waiting in my inbox for the waist to hip ratio project I’m working on and they’ve been rolling in all day! 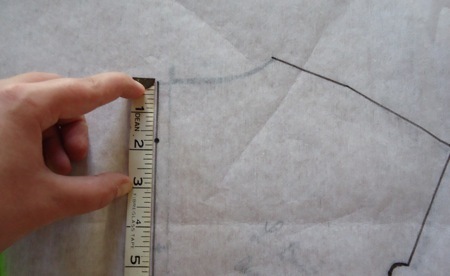 If you have a minute, I’d really appreciate it if you’d contribute your own measurements, too. Once I have a nice large set, I’ll play with the numbers and write all about it! This time of year, I often do “sweatshop sewing” for my family. The clothes they like are boring -eh- simple, so it’s easy to cut several at a time and get some bulk sewing done. The Oliver + S Ice Cream Social dress is a favorite with my daughter- it’s a very easy to wear dress. I keep an eye out for fabrics she would love, in “Lila” colors, stockpile them for a while and then sew three or four garments at a time. The cutting always seems to take the longest, it’s perhaps 1/3 of the total time investment. Once I cut everything, I went into the sewing room to set up my workflow. Lila proudly brought me a sliver of apple fabric (“Mommy! 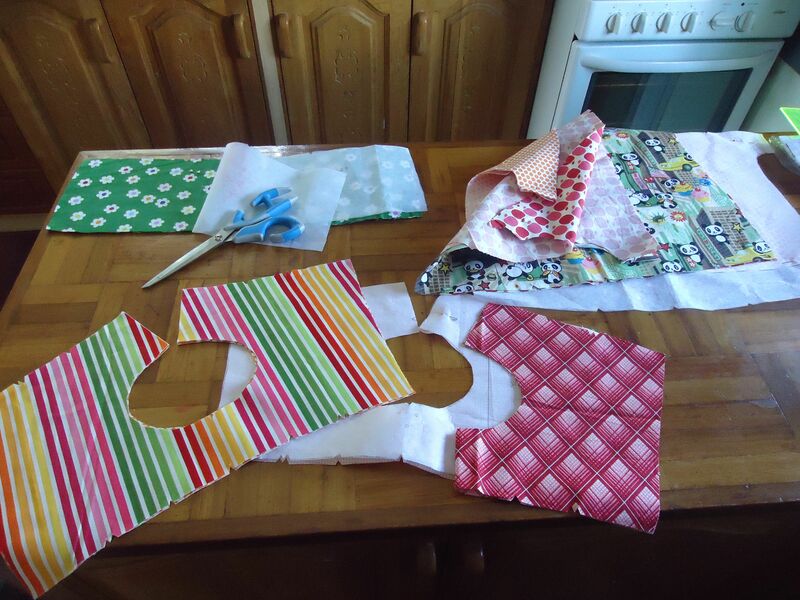 I cut the fabric, too!) and I knew she must have cut it from one of her dresses. 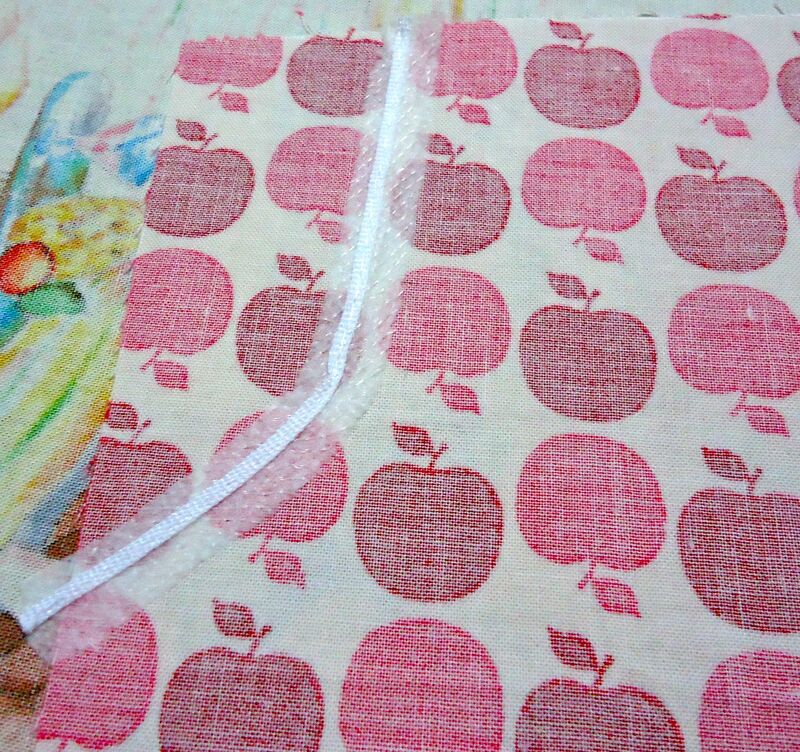 I didn’t have any more apple fabric. I couldn’t be upset with her, she was so pleased with herself. Though we did discuss the difference between scraps and clothes. I figured out how to repair the damage. It’s just a little girl’s dress, after all. I put the cut edges together, and sealed them along the wrong side of the fabric with some fusible bias tape. Any interfacing would work. 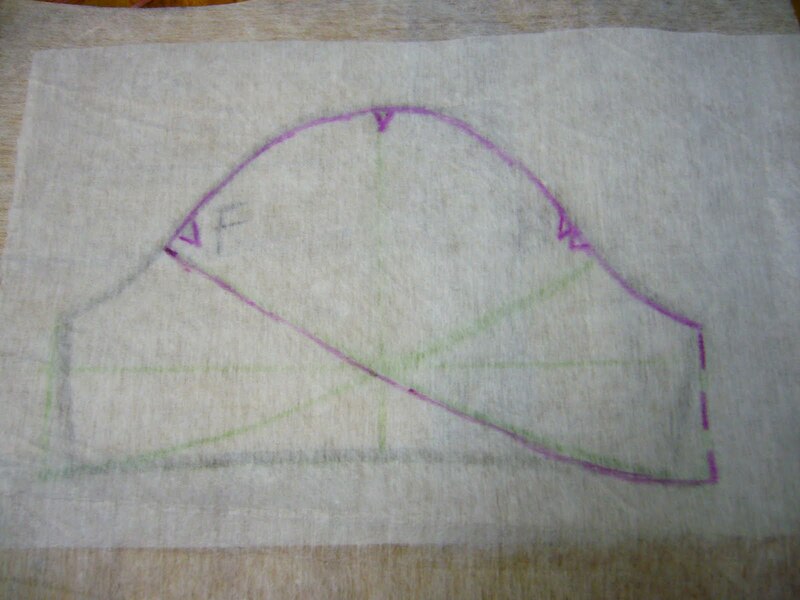 Then I used a triple-stitch zig-zag stitch to secure the edges on the right side of the fabric. This is a secure way to mend two edges, even if it isn’t pretty. 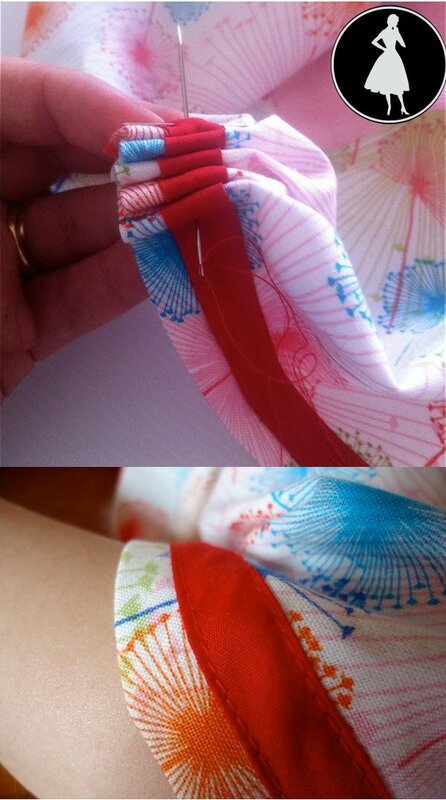 I rummaged around my sewing box and discovered a snippet of bias tape in similar colors, and used a straight stitch to secure each folded edge. Now it’s more a “feature” than a flaw. She sat on my lap and helped put in the gathering, and with some of the simpler serging. 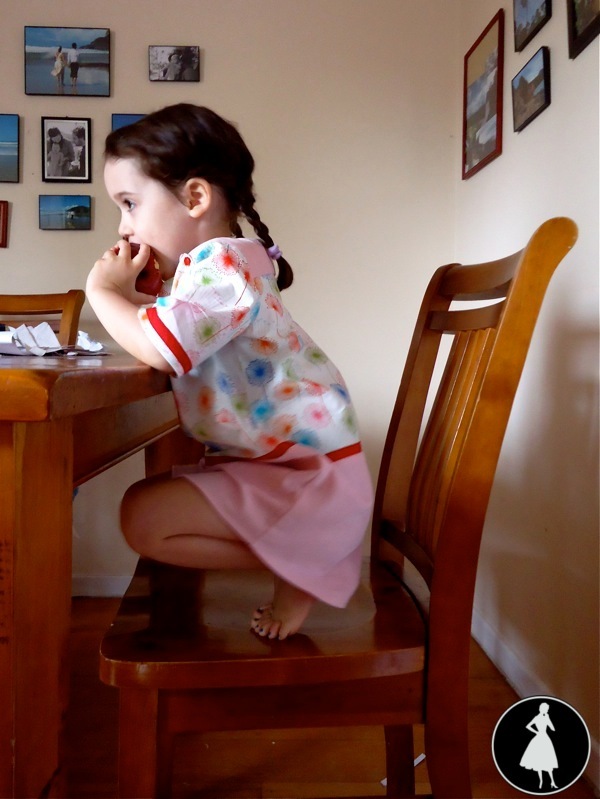 She considers sewing a very serious business indeed, I’m amazed at how well she can focus for such a small person. Sweatshop sewing always seems a slog, until all of a sudden I have a pile of finished garments. My brain tells me this is… well… obnoxious. The pandas were never going to be subtle; then she and I spent some time in the fabric shop picking coordinating prints. She wanted rainbows and flowers, and for such a little bit of fabric I’m happy to indulge her fancies. 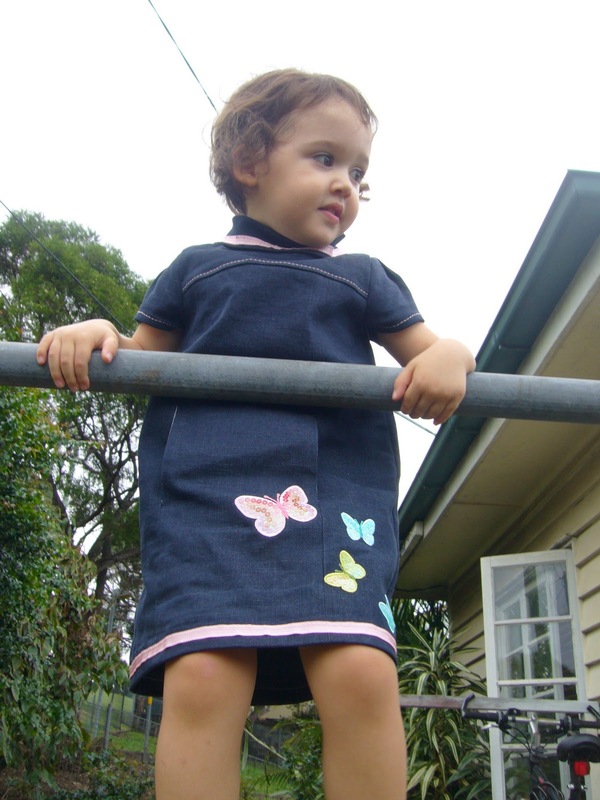 When she insisted on wearing it to preschool the next day and proudly marched along in her new dress, I quit fantasizing about ripping the border. She really likes it. The pattern also has a top, I never made it before but I will in the future. 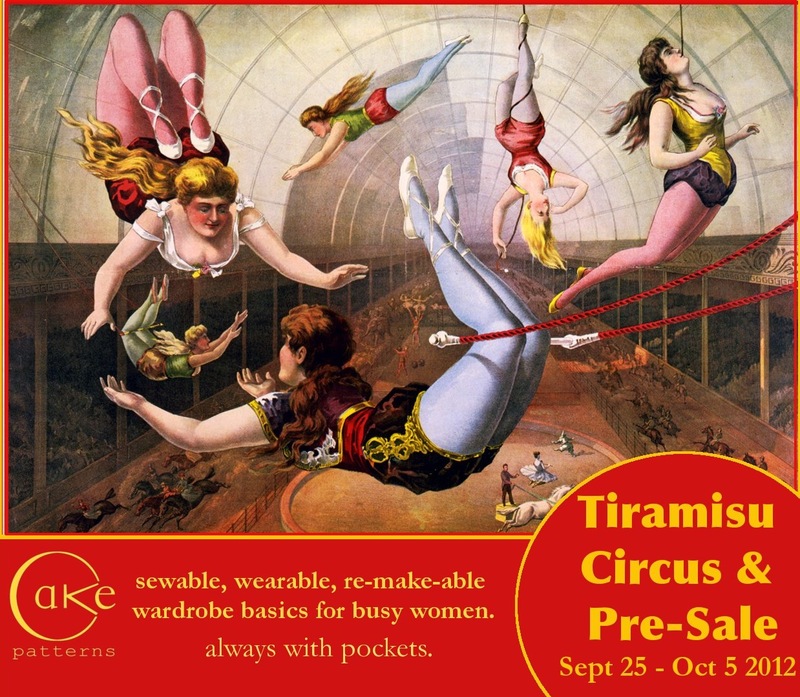 It takes next to no fabric and whips together in no time. 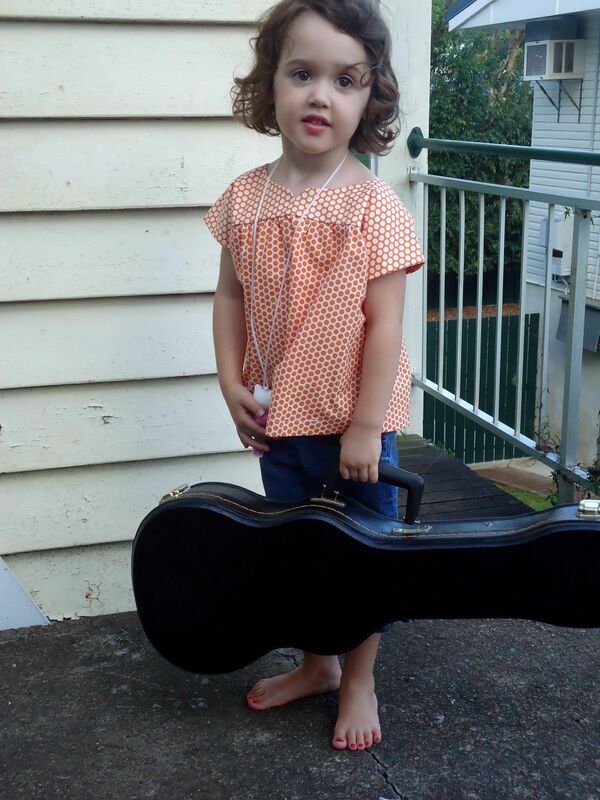 She accessorized with red toenails, a Hello Kitty lipbalm necklace, and Daddy’s ukelele case. I made the jeans two years ago from another O&S pattern, she still wears them. Close-up detail of the fabric, and the enormous white button I used. 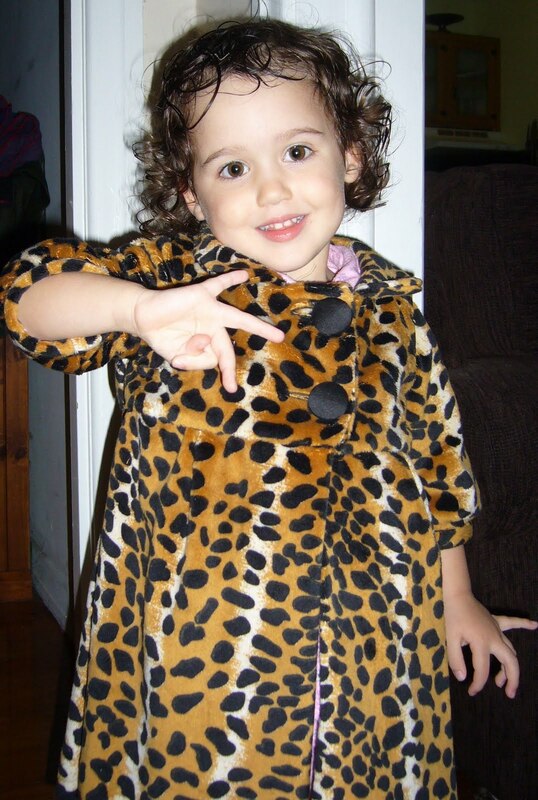 Animal Prints for a Little Girl: Yes or No? 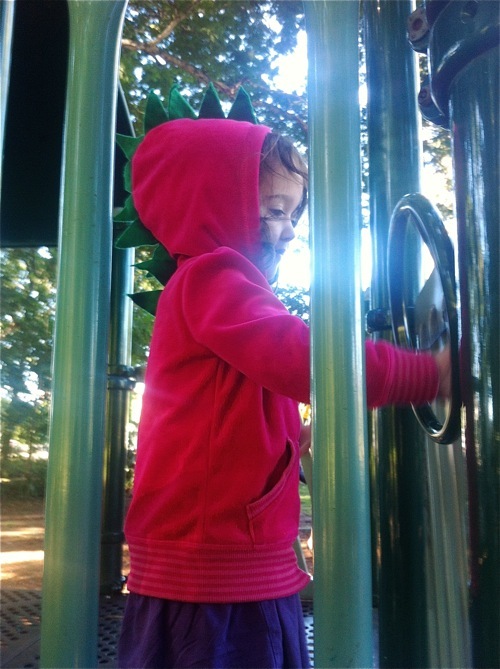 Months ago, in the dead of summer, I had the idea to make Lila a Minki house coat this winter. Minki is sofffffft like kitten fur and tends to wash well, so I let Lila choose from the huge selection of Minki at work. She’s obsessed with tigers and insists this is tiger print. Ok, kid. The spots and color variation will help hide toddler messes, right? She recently received an invitation to her cousins’ jungle-themed birthday party. Prizes for costumes. Personally, I’d rather be hung by my thumbs than make a cutesy leopard sort of costume, so I thought I could kill two birds with one stone- a cute little minki housecoat with a button-in tail and an ears headband. 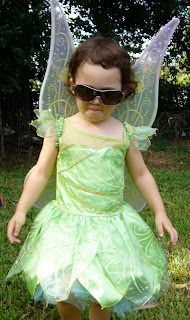 My daughter won’t be a pariah at the party and I won’t have to make one of those costumes. It’s win-win, right? (How does that kid pee in that costume?) I drafted most of the housecoat pattern, borrowing a Peter Pan collar and the sleeves from two Oliver + S patterns I have on hand. 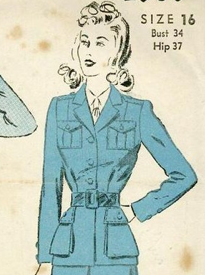 The sleeves stop at the elbow, and the hem stops at her knee. 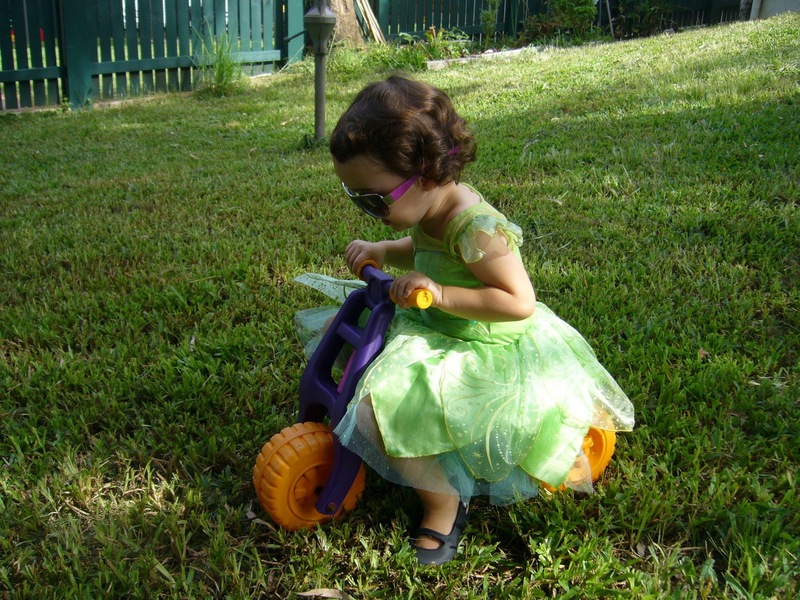 She’s precious, but little kids aren’t very neat or graceful and I don’t want to impede her physical activity with overlong skirts or sleeves. I didn’t question the choice of fabric for a little girl’s coat until I’d set in the collar and the sleeves. All of a sudden I thought I might just be walking a fine line between creative interpretation of a theme (jungle for a toddler party) and dressing my baby like a tiny tart. Once I added the lower part of the coat, I thought it might be decent. After all, it’s a cross between a utility at-home garment and a costume for a kiddie party. However, the coat turned out much nicer than I expected. It’s neither heavy nor light, and drapes beautifully. I couldn’t help self-lining the bodice so its soft against her skin, and I used black silk buttons. Again, I couldn’t help myself. This could serve as a lighter weight alternative to her “proper” winter coat. 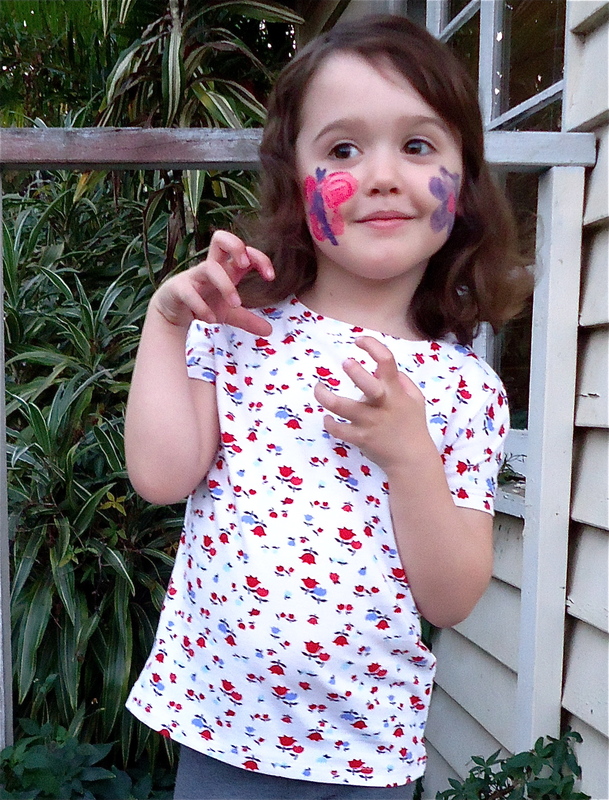 Would I be the world’s worst mommy for dressing my 3-year old in generic animal skin and parading her in public? 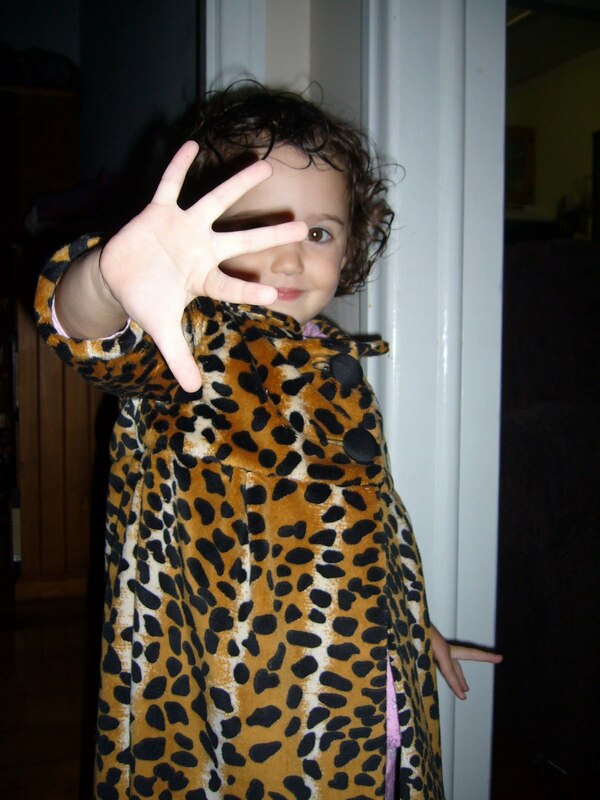 Lila likes the coat, it fits well and allows for little girl antics. I want to avoid venturing into the territory of Questionable Taste. What is it about animal skin? What does it say? Can kids wear it? Do you wear it? Am I being a prude, or worse? Should I just start over and make the dreaded all in one costume with ears and a hood? 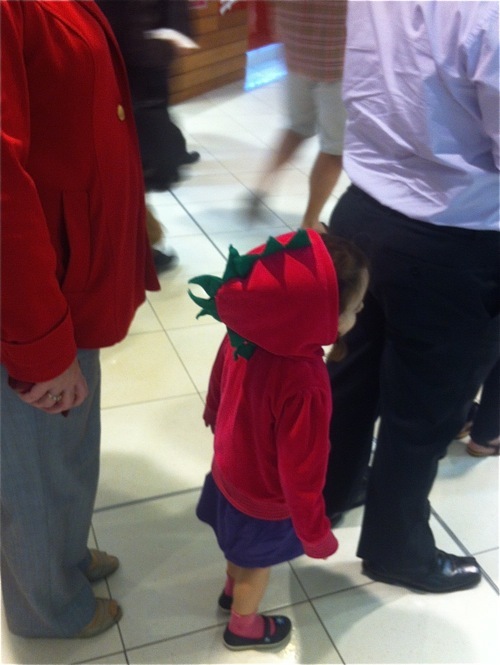 Is it ok to dress a little kid like a miniature adult? 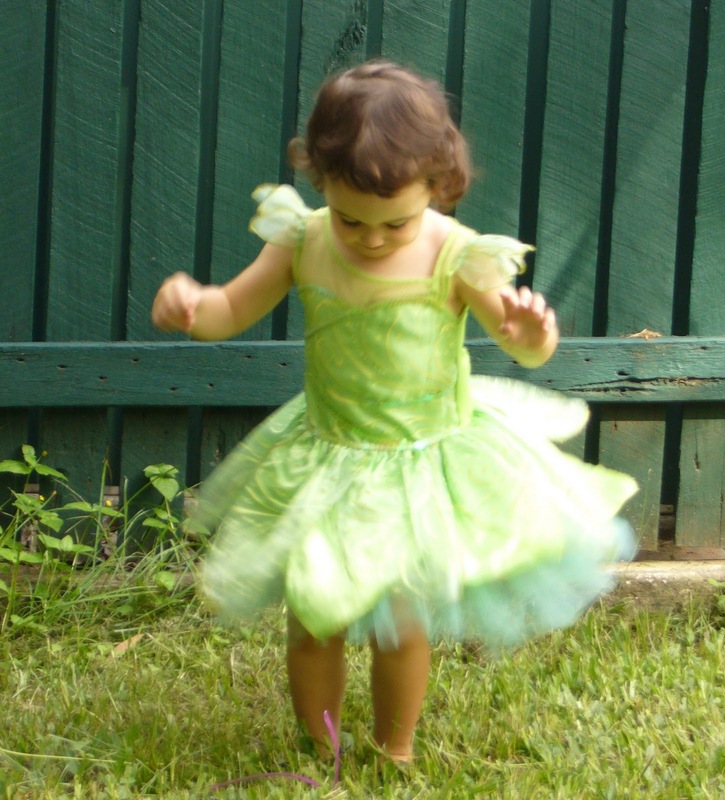 Should a child be infantilized through dress for as long as possible? Where’s the line? Am I over-thinking it? Uta makes nice clothes for kids. 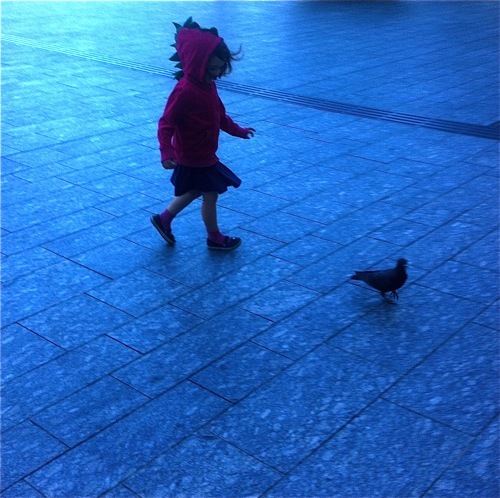 Kids can’t really blog about what they wear, so I enjoy Uta’s posts on kids clothes she makes. Mom sometimes shops end of season sales for designer kids-wear and sends her picks to Lila- just in time for our new season. 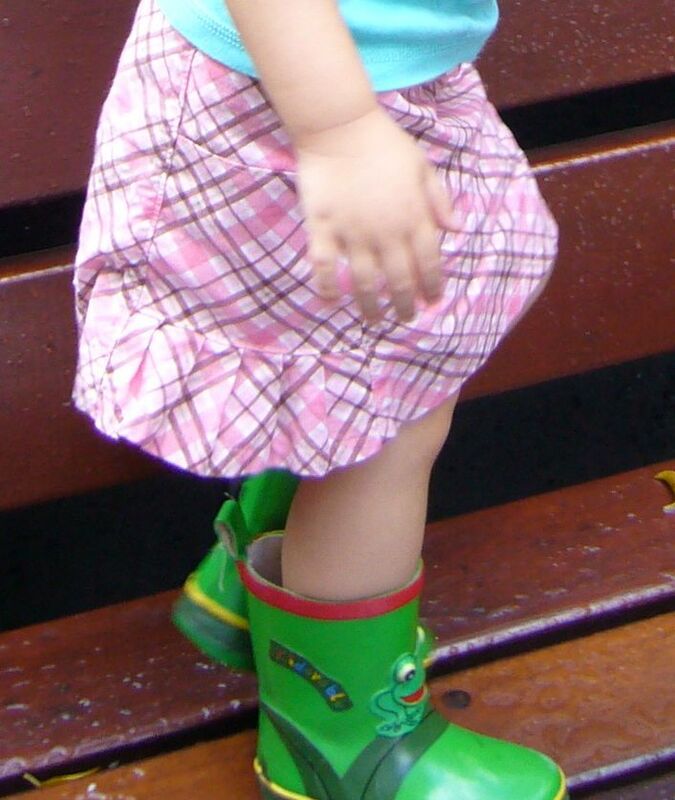 Two years ago, she sent Lila two little skirts, one pink plaid and one khaki. 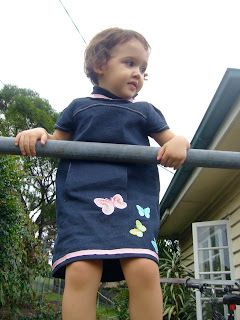 She’s worn them ever since and only just grew out of them, they were incredibly useful wardrobe pieces because they matched nearly every top my little girl owned. Since she grew out of them, I thought to replace them with some mommy-made pieces. 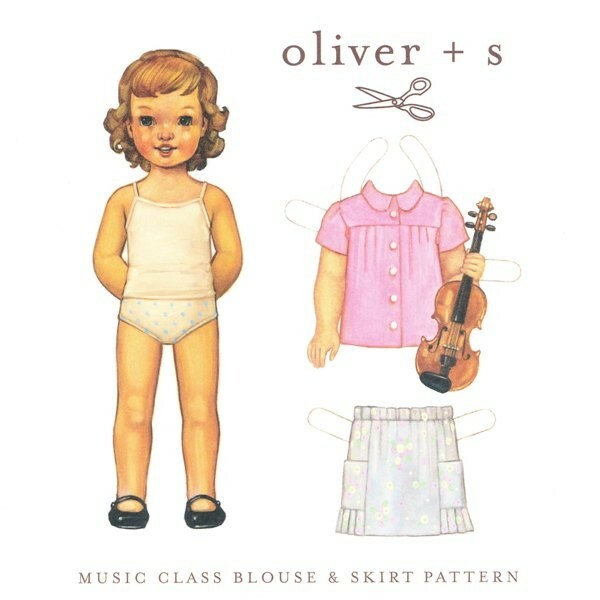 I used the Oliver + S music school skirt to make a pink and brown plaid skirt. She loves pockets and she wears both of those colors well. Mommy is happy. 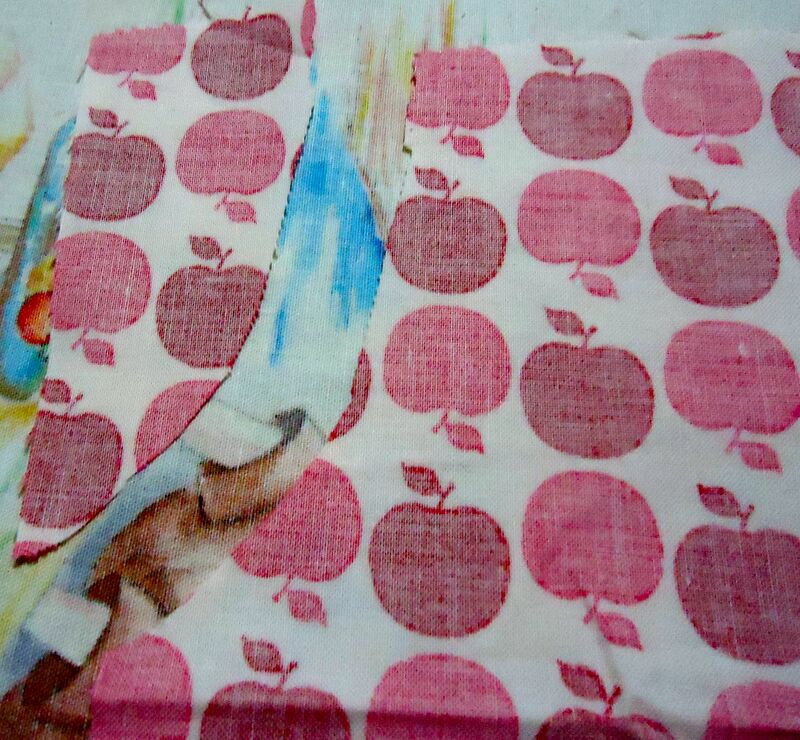 I used a print which had the plaid set on the bias, with a straight grain. The skirt goes together in no time at all. I consider the pocket a major plus, she loves pockets and chooses to wear pieces which feature pockets more than any other item of clothing. I try to guide her fashion choices, but she’s come to an age where I allow her to put together her own outfits, provided they aren’t too stained. This ensemble is pure Lila style. She has a lot of input into the fabrics and appliques I use in her clothing, it’s a way we work to find common ground. This little girl knows what she likes. 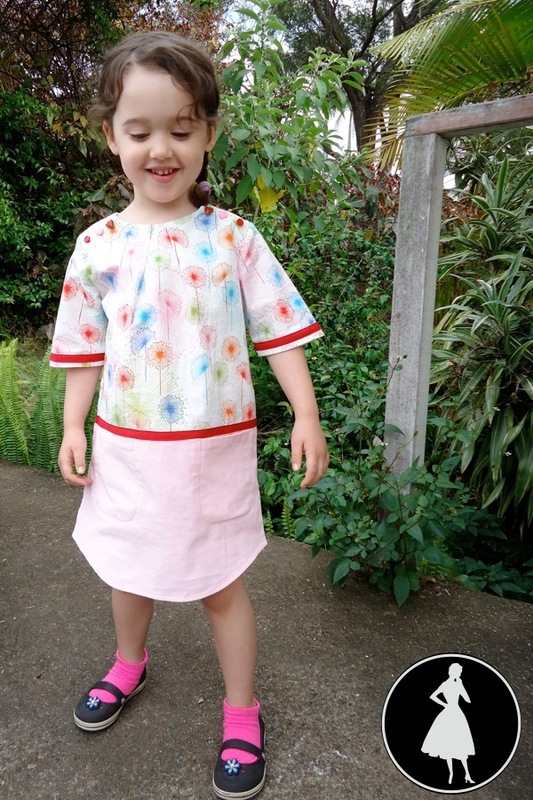 This is a great little skirt, I’d highly recommend it for any sewing mommies of little girls. 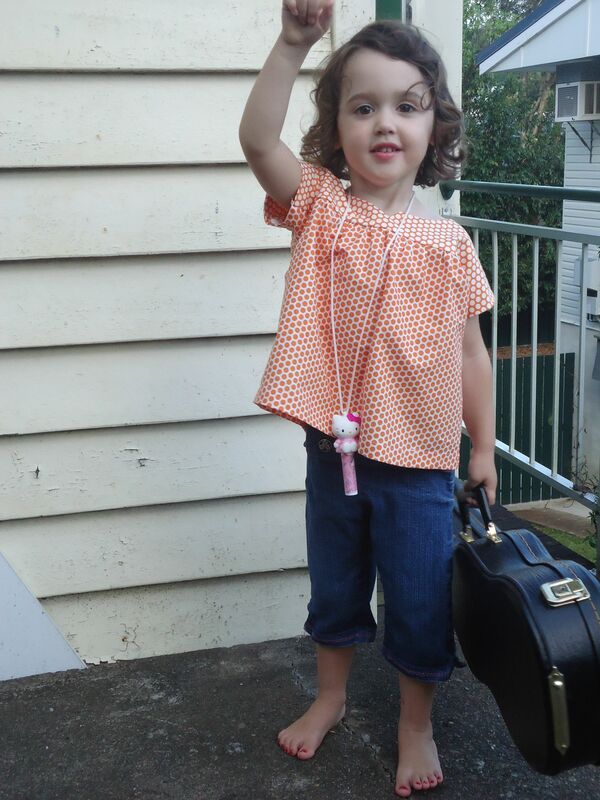 She gives it two thumbs up, and wears it at least twice a week. For winter, she’ll wear it over leggings. I can guess she’ll wear this until it falls apart. 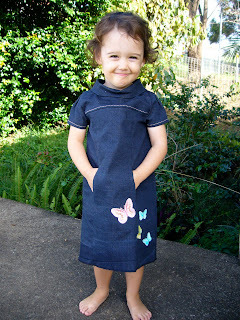 This is a clever, sweet little pattern and deserves a place in every little girl’s wardrobe. I’m working on a few little winter shirts made from the top as well as a sun jacket- she noticed I don’t put on as much sunscreen as she does and demanded a sunjacket like mommy’s. I’ll use this pattern again to make her a khaki colored skirt from- wait for it- wide-wale corduroy. I’m wary of posting too many photos of her both because I have the mommy-fear (what if a deranged pervert uses her photos or starts following us around because she’s so precious? ), but also because I don’t want to wear you out with too much kids clothes. 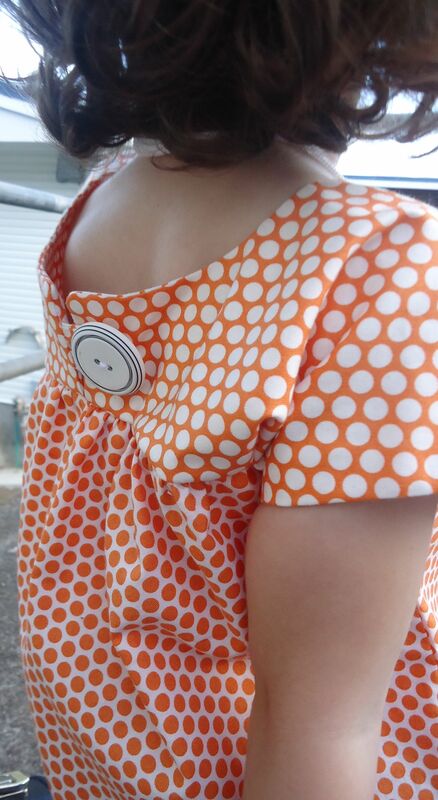 Her little bits and pieces provide me a welcome relief from miles of double welt pockets. I make little things for her because she’s tiny and lovely, but also because it’s nice to finish something in one sitting. 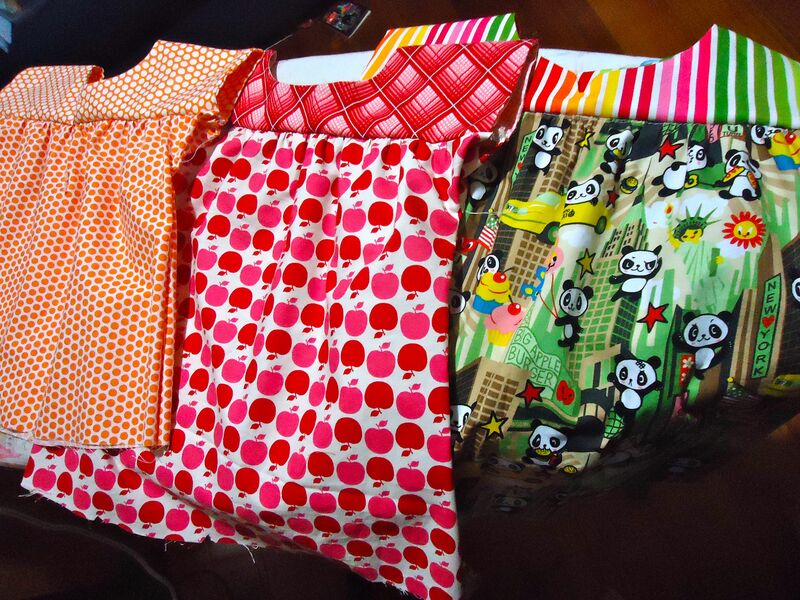 Anyway, my very first sewing came from the desire to make clothes for my dollies. 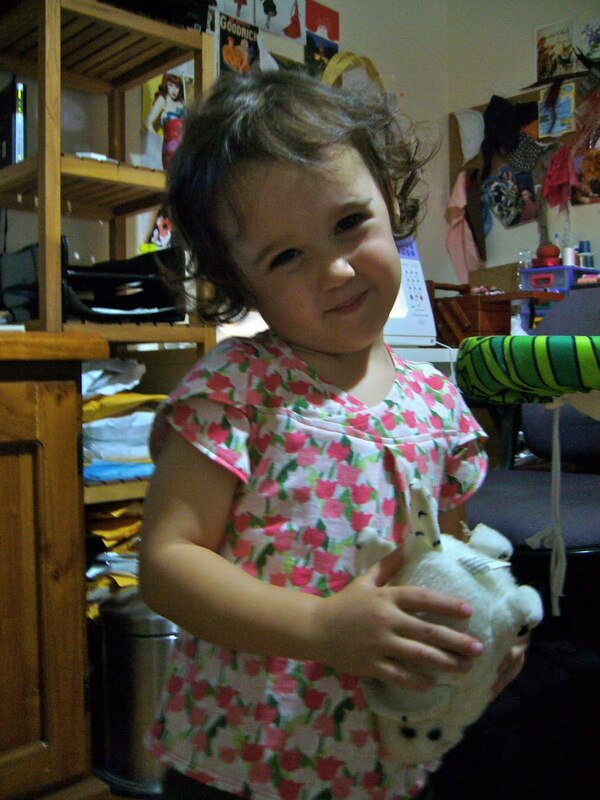 Now I have a sweet, opinionated, living dolly to dress and we have a really good time working on her clothes together. My motherly aunt sent Lila a fairy costume- we mark her 3rd birthday in a few weeks! This came from the Disney store. Once I ripped off the Tinkerbell iconography, I fell in love with the fluffy, sparkly little thing. 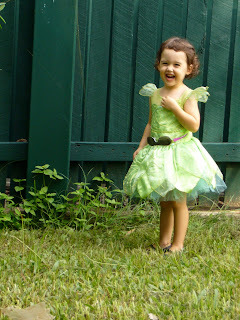 She picked the embellishments and we worked together with Daddy to decide the placement. She also helped feed the pieces through the serger and applied the clapper to the seams after I pressed them. I have an apprentice. The dark denim begged for a break in its sobriety- she’s a very small girl, after all. Like most little girls, she adores sparkles and bright colors and I want to encourage her to express her creativity from a young age. I rummaged around at work and came up with this narrow pink grosgrain, which I applied to the collar and hem. 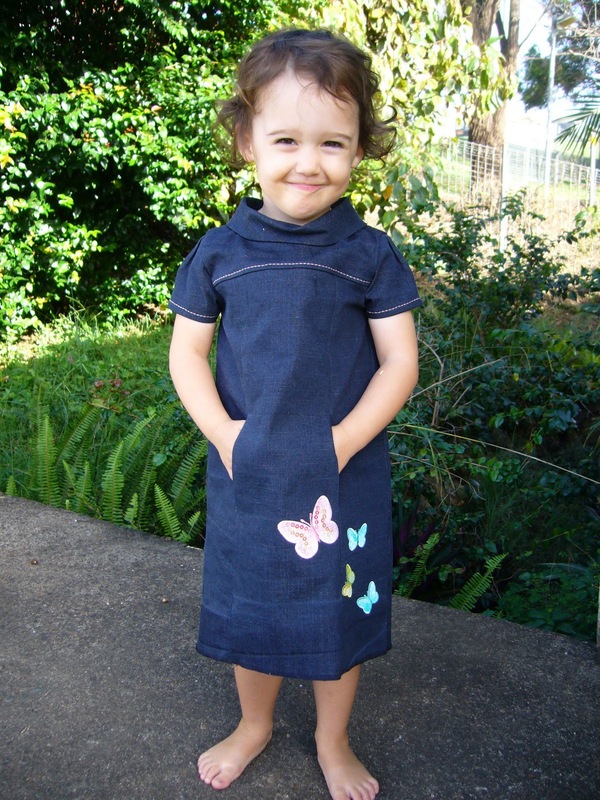 I’m still playing with the notion of covering the bottom part of the dress in more of the same butterfly appliques. I used an old shirt for pocket pieces. 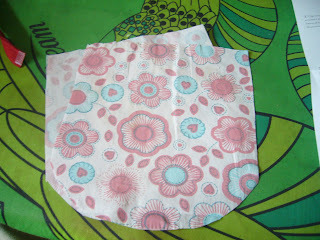 I liked the pocket, it came together easily and the instructions were great. In fact, as usual Liesel writes with painful clarity. The whole dress took an evening of sewing, just all of a sudden I had a little dress. 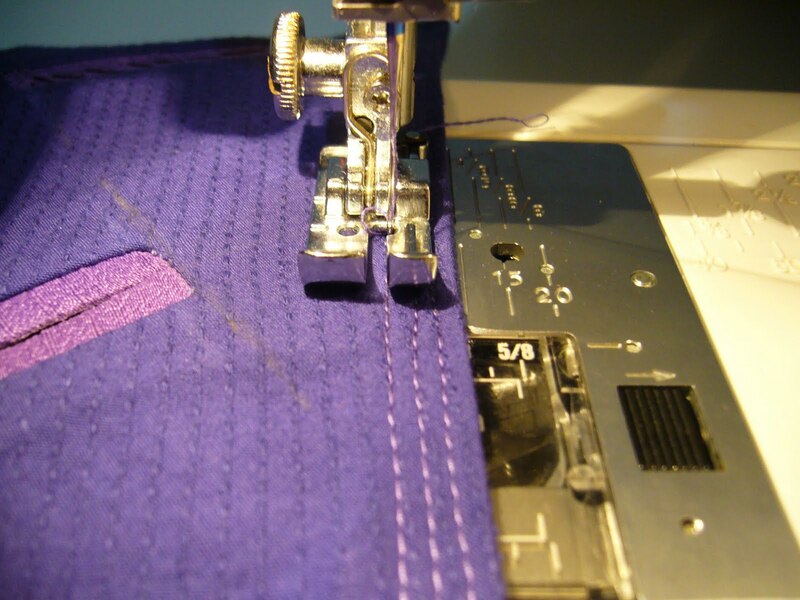 I like Lila clothes for that reason- quick to cut, fast to finish, near instant gratification. I have as much fun as I used to when making doll’s clothes, except this dolly can move and talk and tell me she wants sparkly butterflies on her skirt. 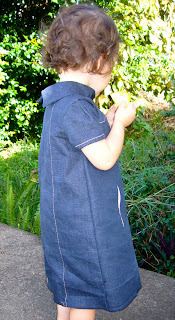 The dress pattern calls for a lining, I left that out for this heavy stretch denim. 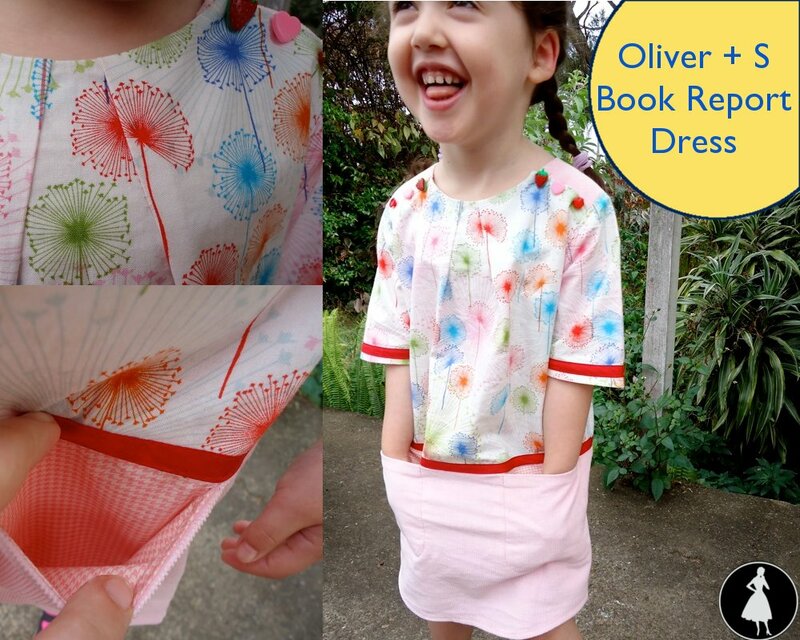 I used the pleated cap sleeves from the Oliver+S Music Class Blouse. Although the sun sinks a little earlier each day than the one before, it’s still summer here and I thought 3/4 sleeves would be too hot. I might make her another for the cold weather- I saw some beautifully printed pinwale cord at the fabric store. Next- my plans for Sherry’s RTW jacket challenge. Storm-blue corduroy. I may have enough to make the suit! I’d like to thank everyone who commented on my recent ponderings. You give me plenty to think about, it’s so nice to have a fresh perspective sometimes!